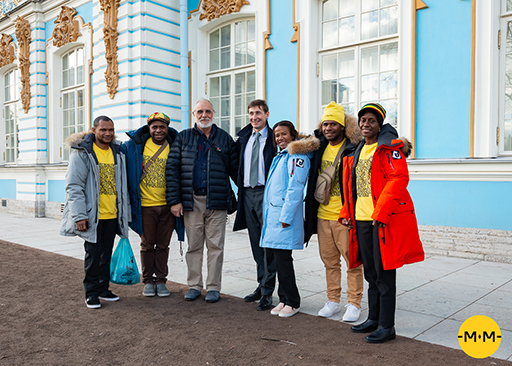 The first visit of a delegation from Papua New Guinea in the modern history of Russia has taken place! 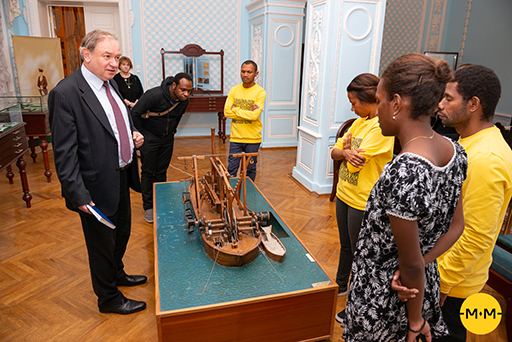 It was made possible through the efforts of Nikolay Miklouho-Maclay’s descendant and full namesake, founder and director of the Miklouho-Maclay’s Foundation, who organized this visit with support from the New Generation program of the President of the Russian Federation, the Ministry of Foreign Affairs of the Russian Federation, and the partners of the Miklouho-Maclay’s Foundation including the Melanesian Foundation. 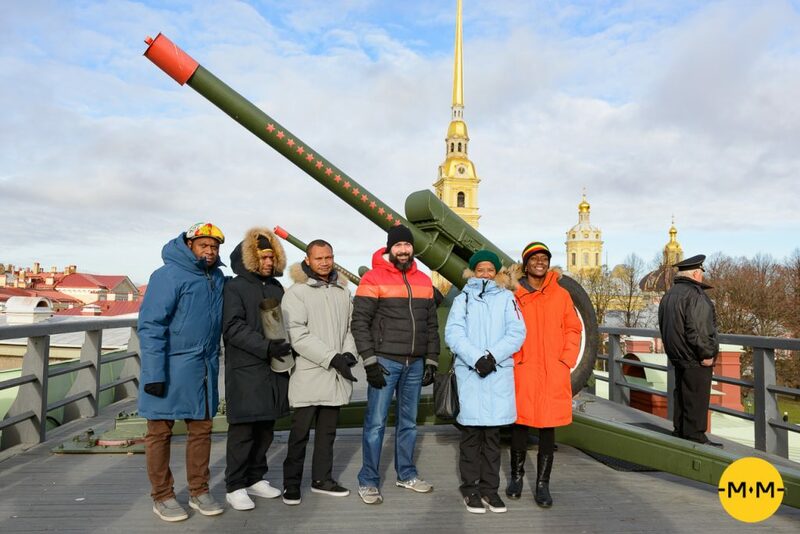 Five delegates, active public figures of the insular state, lecturers in Political Science and Social Sciences at the universities of Port Moresby and Madanga, visited St. Petersburg between 21 and 31 October, 2018, in order to develop and enhance social, business, and scientific ties between the Russian Federation and Papua New Guinea. 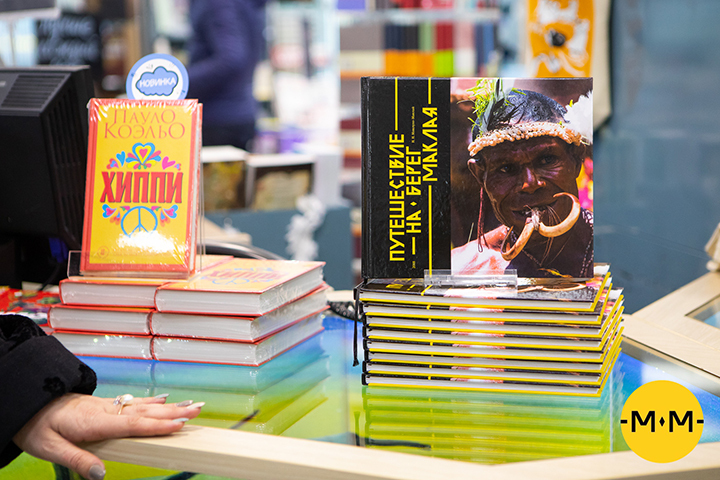 The independent nation of Papua New Guinea is familiar to millions of Russian owing to the books about Miklouho-Maclay’s exciting journeys to the area and his first meetings with the local population, who afterwards called him ‘the Big Great Russian’ − Tamo boro rus or Karaam Tamo. What do we know of this island in the 21th century? As it turns out, very little. 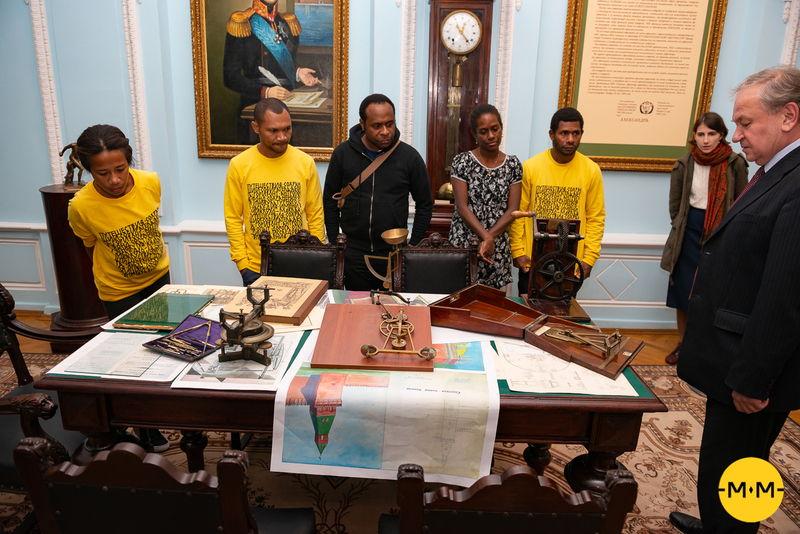 The information that we can glean from the Russian web is largely unreliable, and the stories about Papuans still living in the Stone Age, are untrue. 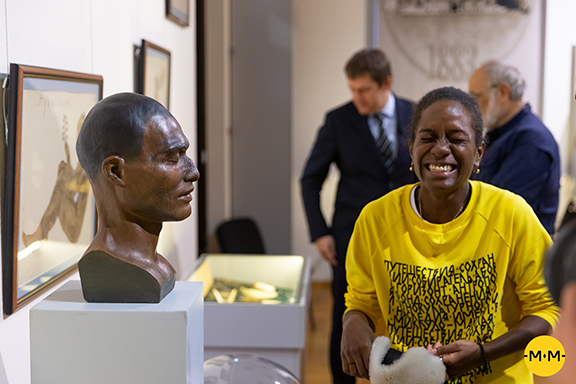 What are they like, these people we know so well from Nickolay Miklouho-Maclay’s book Travels to the Maclay Coast, from the 1984 film The Coast of His Life with the lead character played by the acclaimed Soviet actor Yuri Solomin, from Tynyanova’s book The Moon Man? 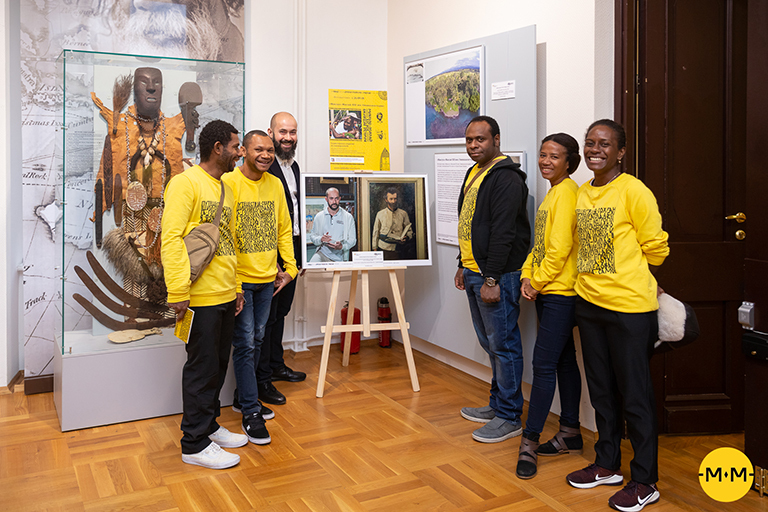 In the 19th century, when the great scholar and explorer Nikolay Miklouho-Maclay came to New Guinea, the local people were curious to know what the place where he lived was like and when they would be able to see ‘Maclay’s village’. This question was as relevant in 1971, when a research expedition organized by the USSR Academy of Sciences visited the Maclay Coast. 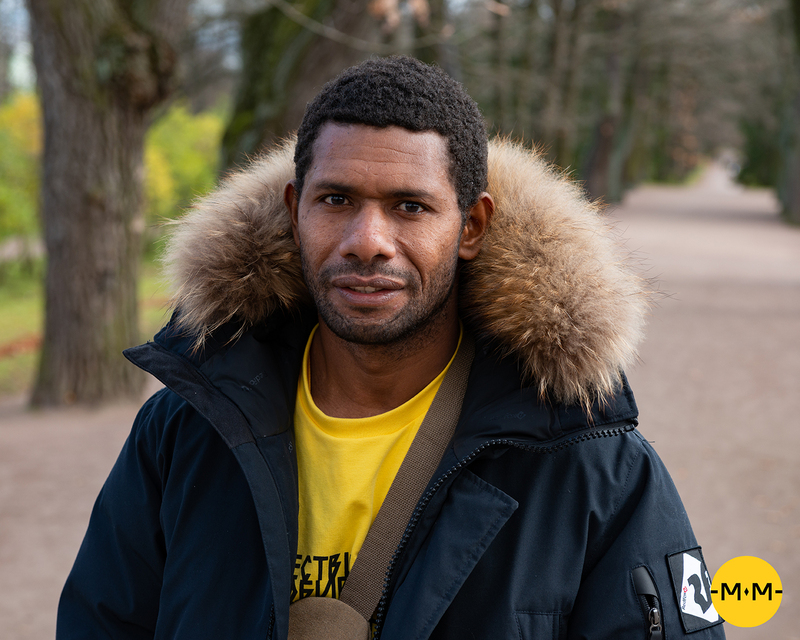 And finally, having returned from the distant Maclay Coast, Miklouho-Maclay Junior set himself a goal – to bring Papuans to Maclay’s homeland. Frankly speaking, this was not an easy task, and the preparation took nearly a year. 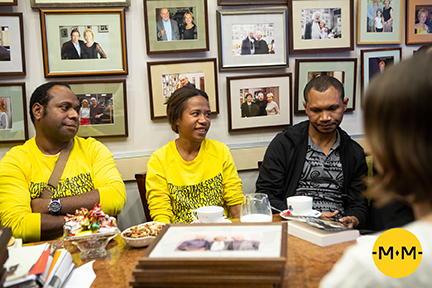 It was important to select active and progressive citizens of Papua who were motivated to forge bilateral relations between our countries, so that this historic visit would not simply remain a pleasant memory, but would lead to contacts between the people of the two countries; we had to provide visa support, secure funding for the delegate’s trip, arrange cultural activities, but also working meetings with organizations interested in establishing ties with Papua. 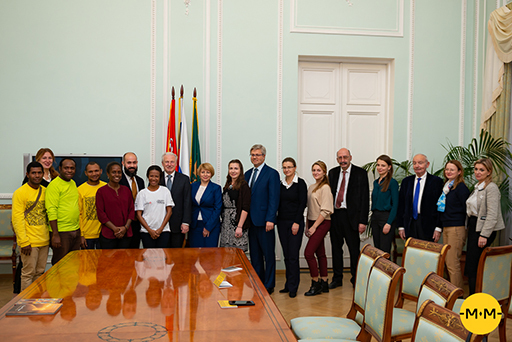 While preparing the trip, the Miklouho-Maclay Foundation signed a memorandum for collaboration with the University of Port Moresby at the St. Petersburg Economic Forum 2018, including the selection of delegates to Russia. 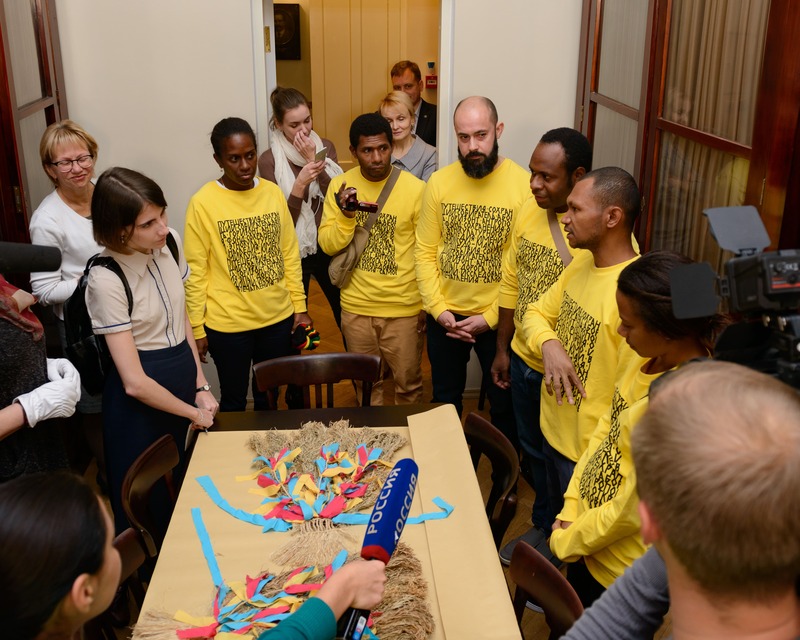 Russia’s contacts with this insular nation could not be described as regular, but thanks to the islander’s memory of the Russian explorer who lived among them and later fought for their rights, lost ties could be restored. 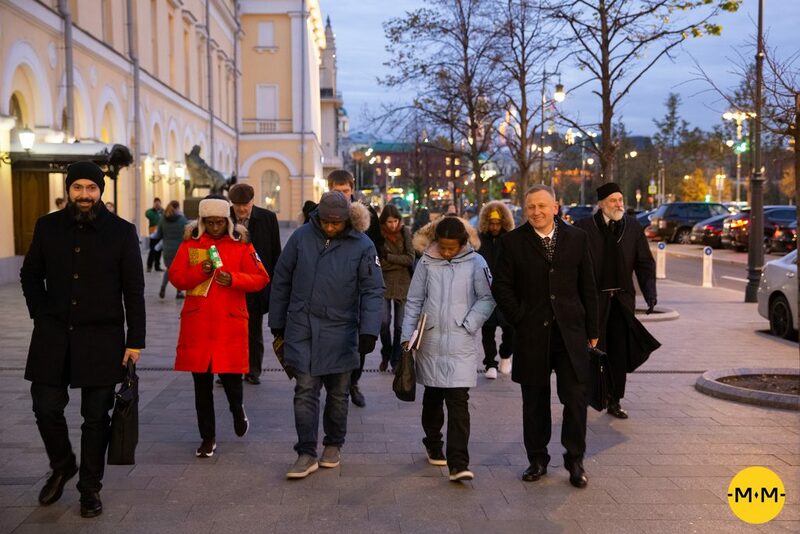 At last, having overcome all the challenges and spent over two days on the road, the delegation arrived in St. Petersburg in the evening of 21 October, 2018. 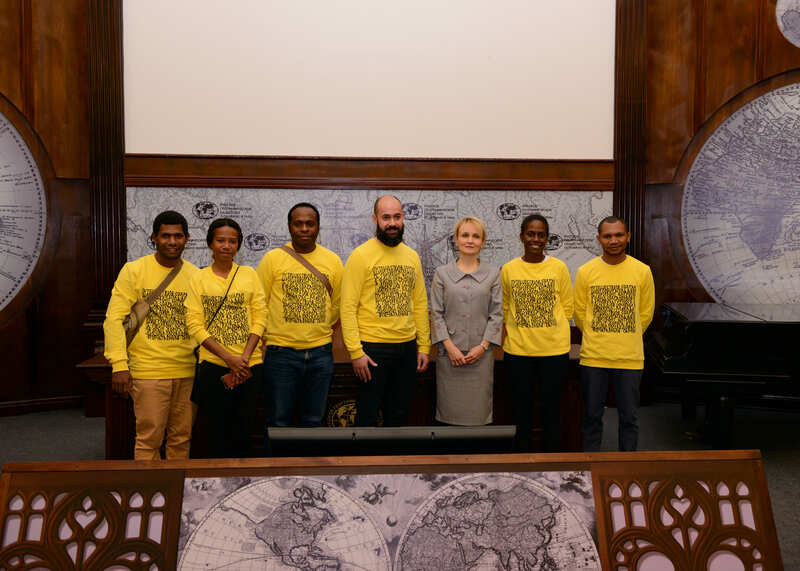 The guests were welcomed by Nickolay Miklouho-Maclay, staff of the Miklouho-Maclay Foundation, and the students from School No. 606, which takes active involvement in the Foundation’s events. 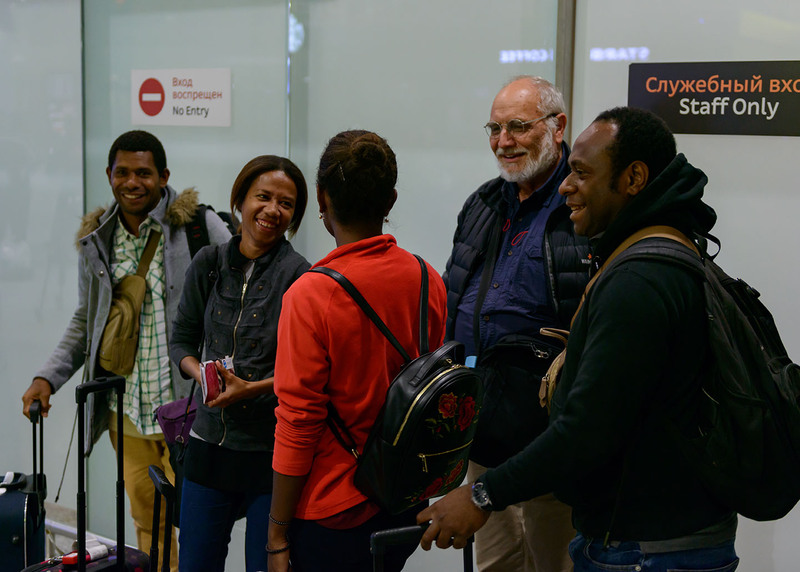 After the much-anticipated meeting and hugs with Maclay Junior, the delegates were immediately taken to the hotel. 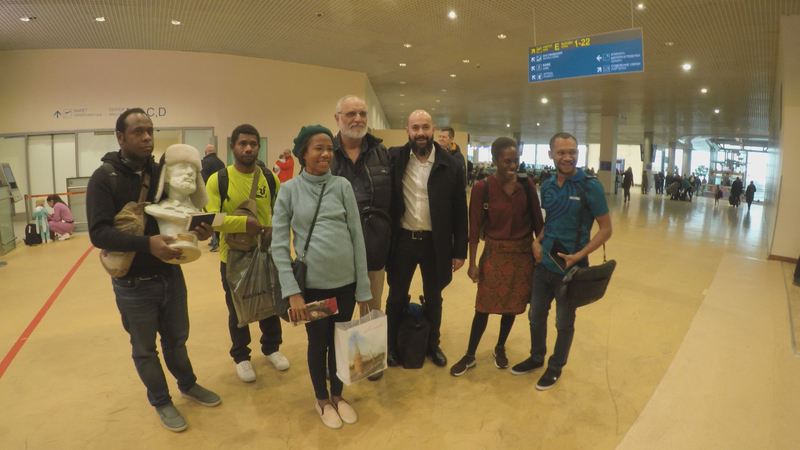 The guests received warm clothes from Red Fox, the Project’s partner, as the next day promised to be very busy, and the weather in Russia is in stark contrast to Papua with its average yearly temperature of 25 degrees Celsius. 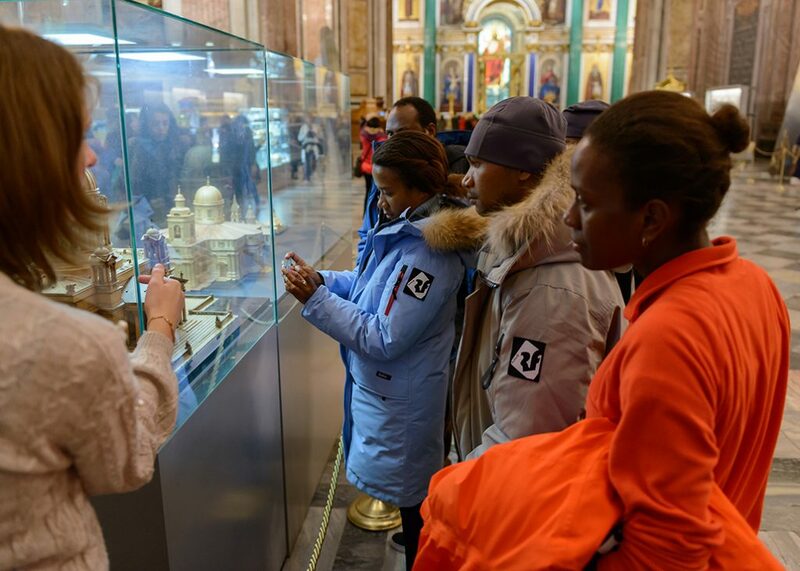 Before the trip, many of the delegates had mentioned their wish to see our churches and cathedrals. 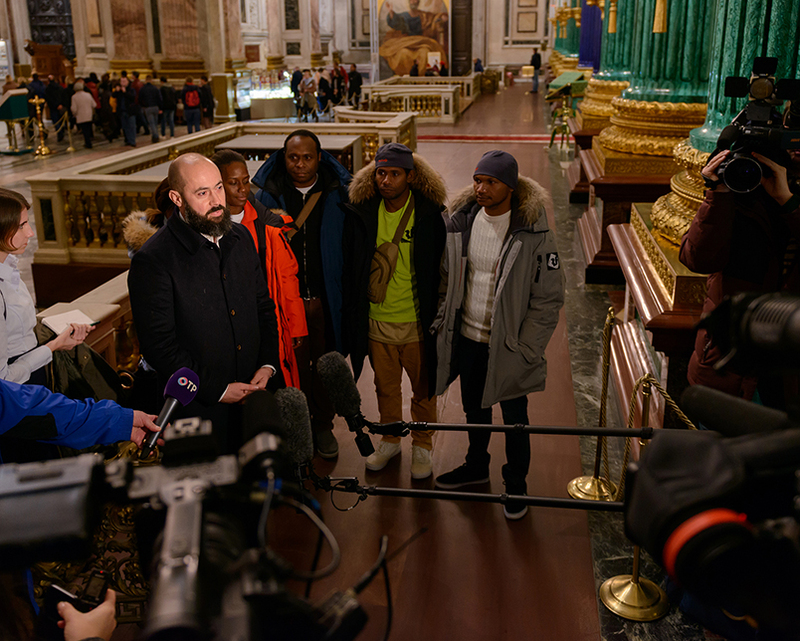 The guests’ wishes were taken into account, and on the first day they were taken to St. Isaac’s Cathedral. 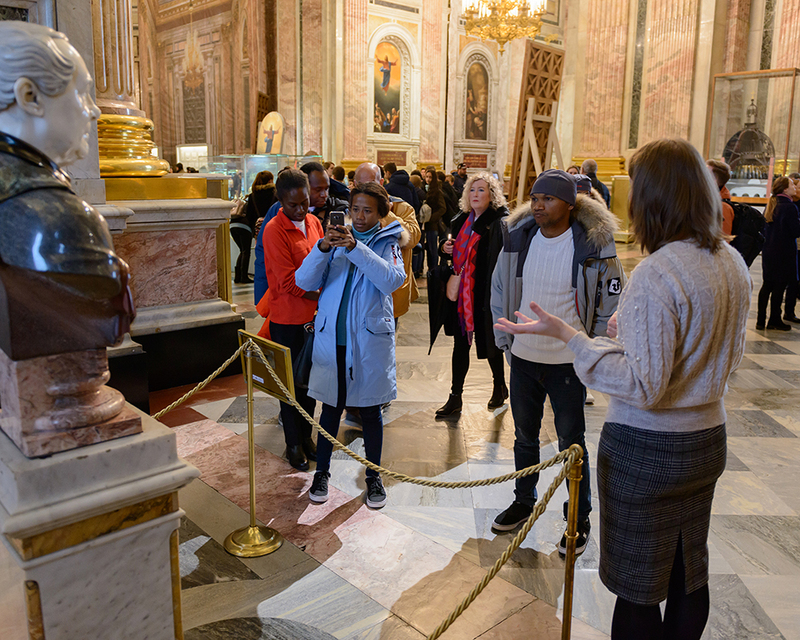 After seeing the cathedral’s splendid interior and admiring its unique and lavish design, the guests climbed the colonnade to enjoy a marvellous view of the city. The bird’s eye-view clearly shows the intertwining of the present and future. Trying to pierce the grey clouds, up rose the Admiralty’s spire and Lakhta Centre’s monumental candle, while the Venice of the North’s old buildings were dwarfed by the glass and concrete high-rise buildings around them, and amidst all this splendour, inviolable and immutable, like many years before, rose the powerful bulwark of St. Peter and Paul’s Fortress, a multitude of tourist boats and speedboats scurrying back and forth around it, rippling the Neva’s smooth leaden surface. But nothing is quite like a walk down the streets and embankments of St. Petersburg. 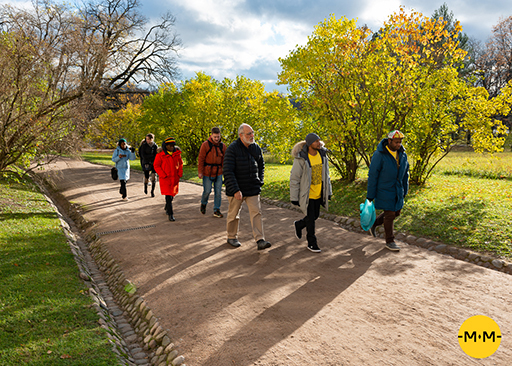 The grey skies, the drizzle and the wind could not stop the guests from taking a promenade. 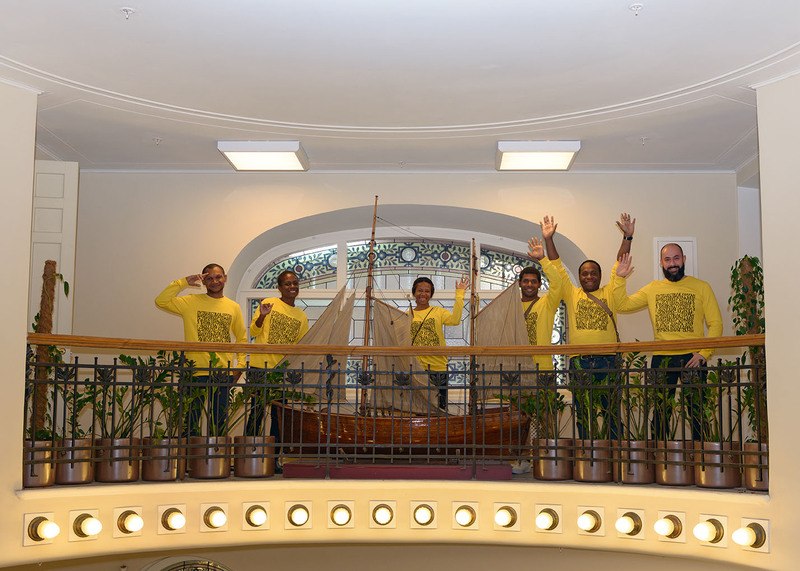 Typically for the city, St. Petersburg welcomed them with open arms. 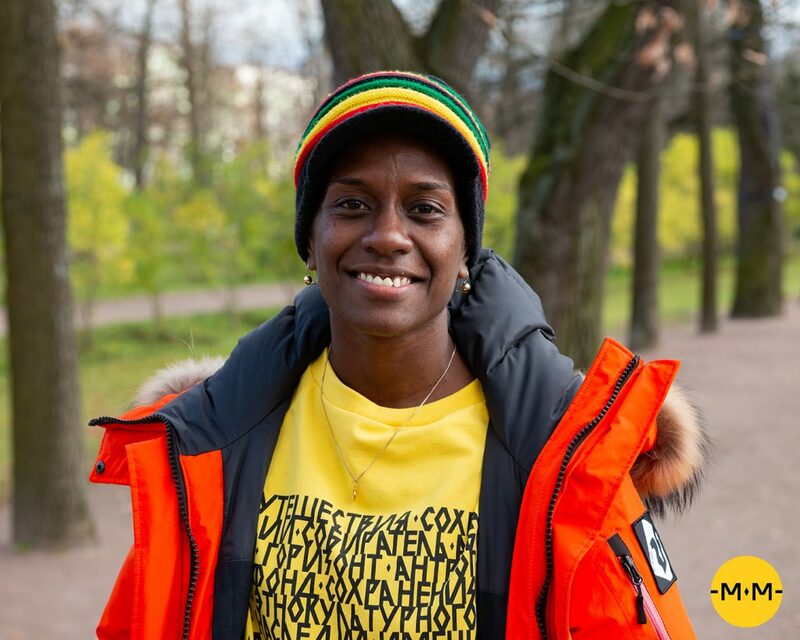 It always embraces those who come to the Neva’s banks with a pure heart and a sincere desire for friendship. 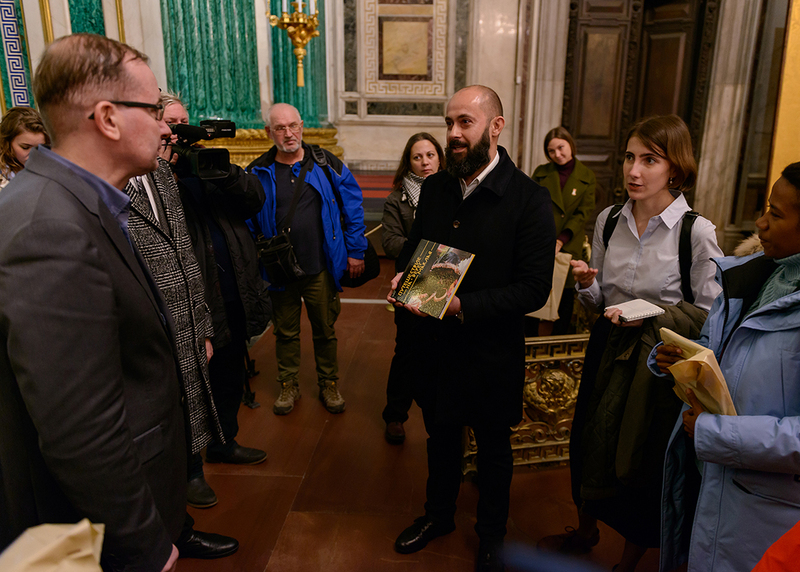 A leisurely stroll from St. Isaac’s Cathedral to Nevsky Prospect took our guests to one of the city’s most remarkable buildings – the Singer House, now the location of the Dom Knigi bookshop, where our guests were greeted with a display of unnorthernly hospitality. 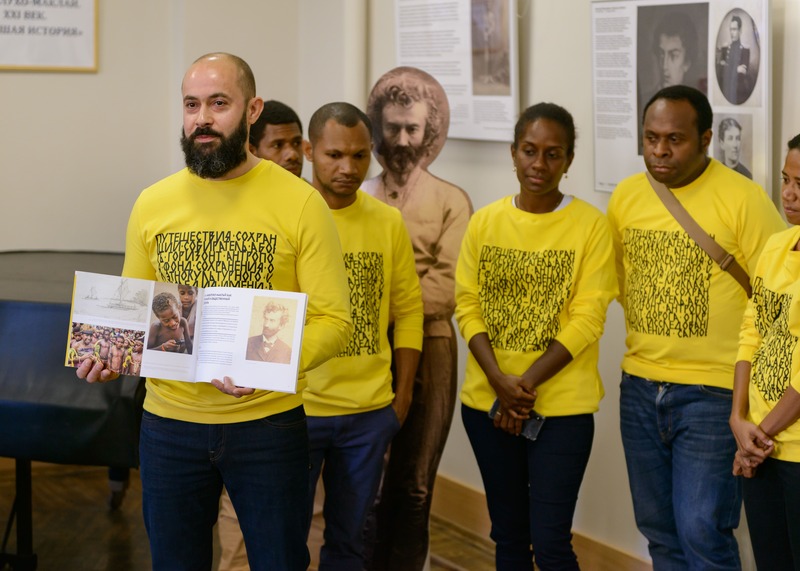 How surprised were they to see the book A Journey to the Maclay Coast written by Nickolay Miklouho-Maclay after the 2017 expedition, an account of the Maclay Coast and the local people, who have preserved the memory of their Maclay and the historic ties between Russia and New Guinea. 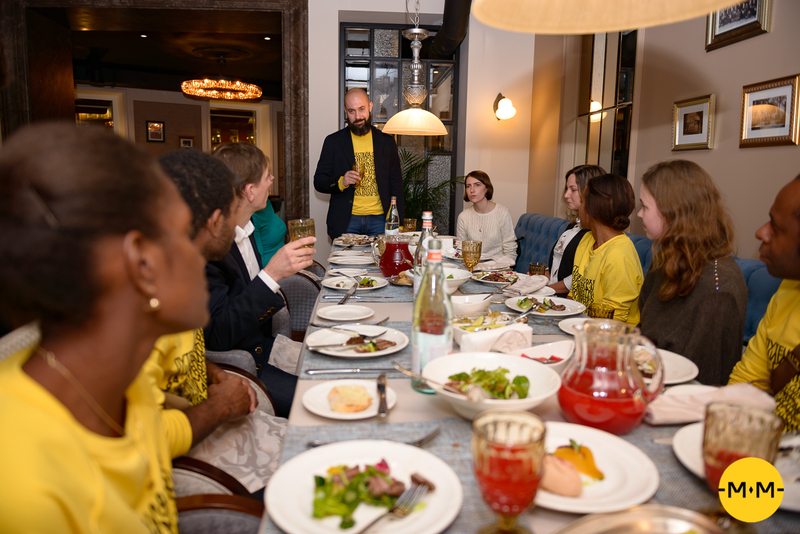 The delegates learned about the culinary traditions from our country’s Soviet period during their visit to Tsentralny restaurant, where they tasted authentic Soviet cuisine at a gala dinner in their honour. 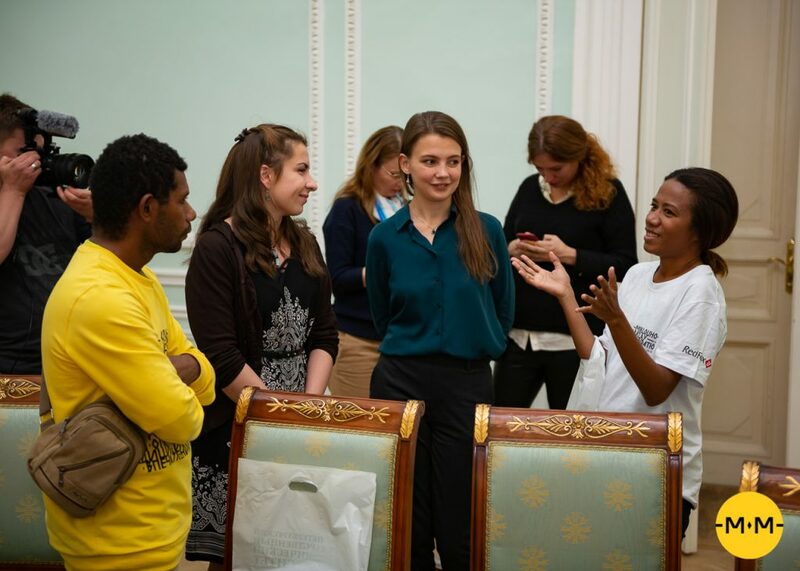 The dinner was followed by a private screening of the new film The Moon Man directed by Nickolay Miklouho-Maclay, with the running time of 36 minutes, which is scheduled to premier as part of the St. Petersburg Cultural Forum on 15 November at 19:30 in the Hermitage’s General Headquarters Building. 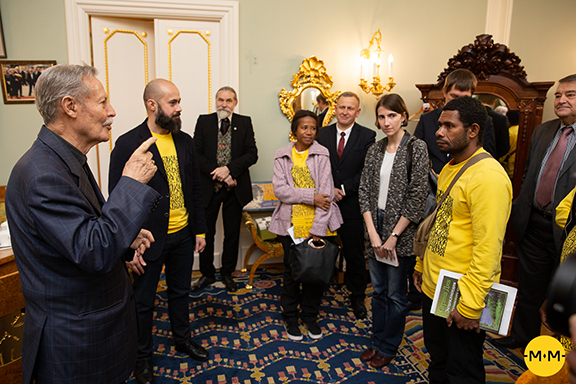 On 23 October, 2018, their third day in Russia, the delegates from Papua New Guinea, accompanied by Nickolay Miklouho-Maclay, visited the Russian Geographic Society, where they were warmly greeted by Zhanetta Karelina, Society’s head in St. Petersburg. 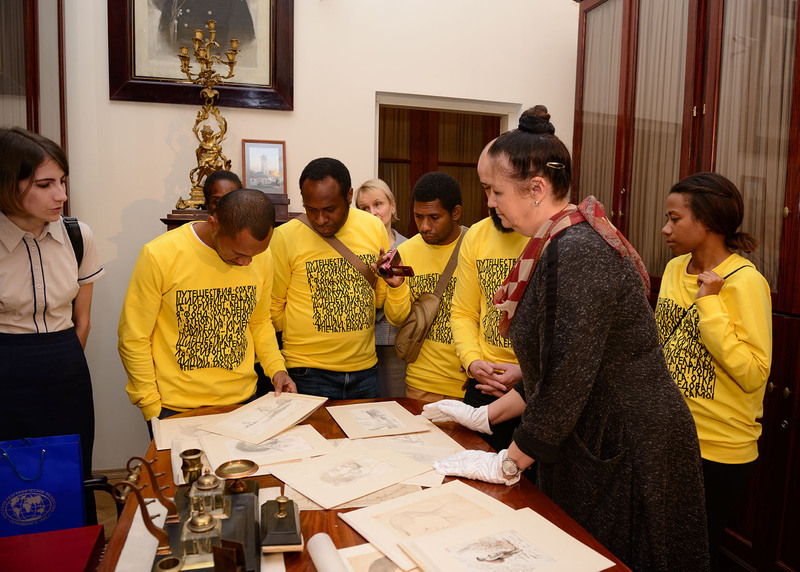 The staff gave the delegates a tour of the building and showed them the original drawings made by the great 19-century scholar, humanist and explorer N. Miklouho-Maclay during his sojourn on the Maclay Coast. 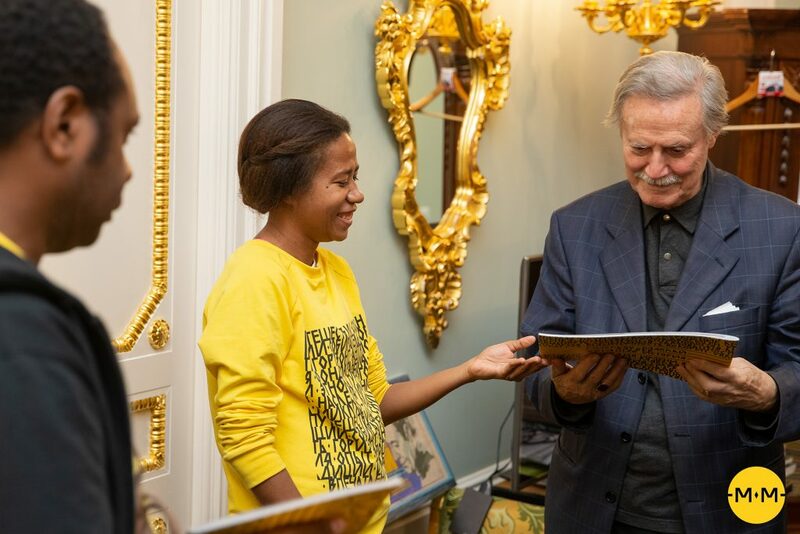 The guests were astonished to discover that Nikolay Nikolaevich was an accomplished artist. 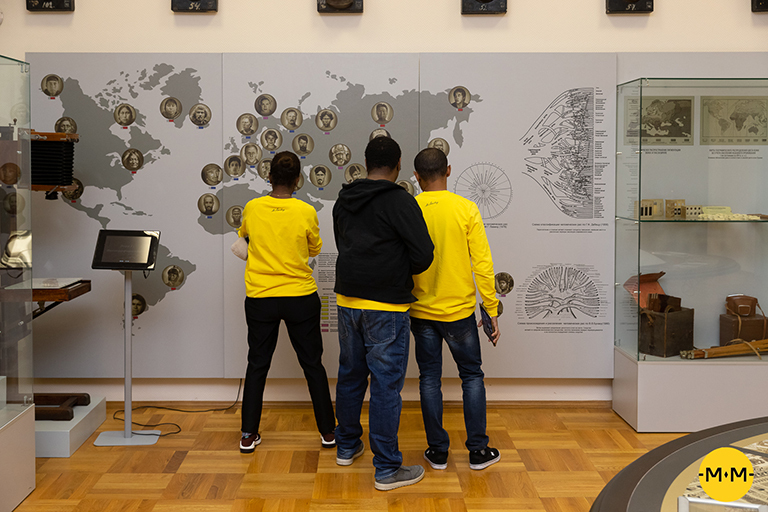 However, they were most fascinated by an antique map in the hall. For a while they were absorbed in the map, where they managed to find their Home with the help from their companions. Incidentally, the names on the map were in Old Russian, prompting a discussion about the difficulty of the Russian language. 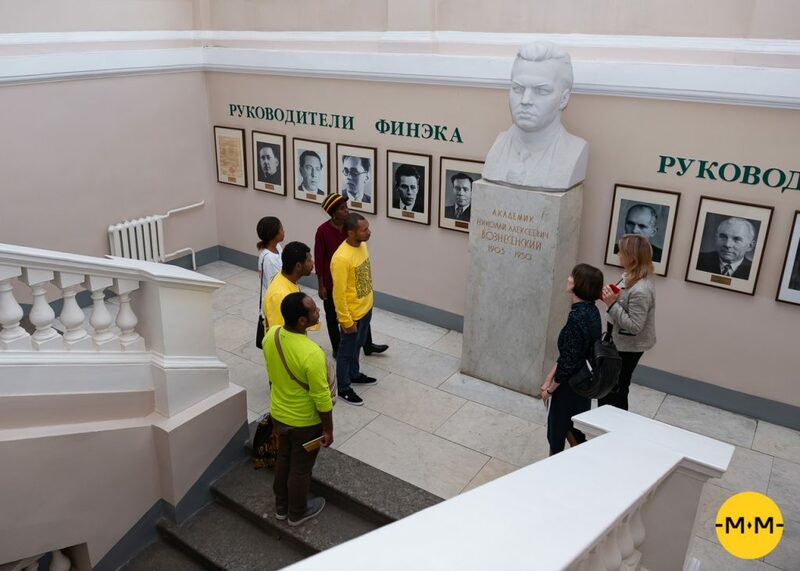 At the Second St. Petersburg Gymnasium located nearby, the delegation participated in the opening ceremony of Miklouho-Maclay. XXI century. 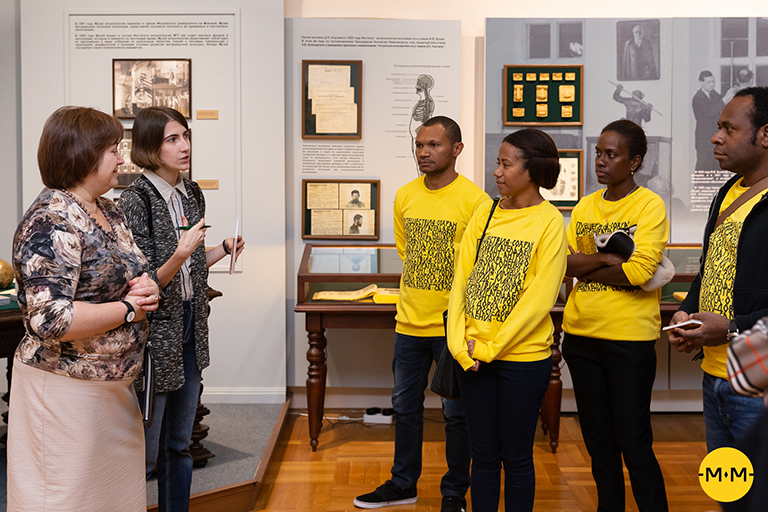 Revived History exhibition organized by the Miklouho-Maclay Foundation with support from its partners and the Presidential Grants Foundation. 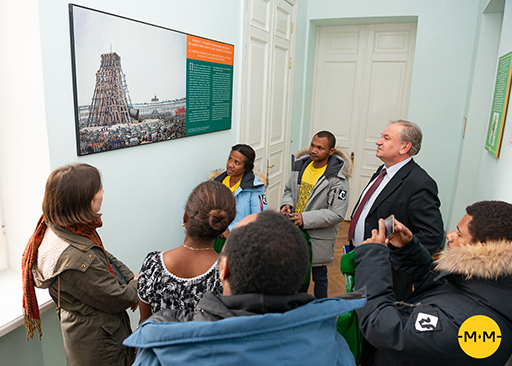 The exhibition is based on the 2017 expedition to the Maclay Coast and has been shown in St. Petersburg, Moscow, and the Novgorod Region. 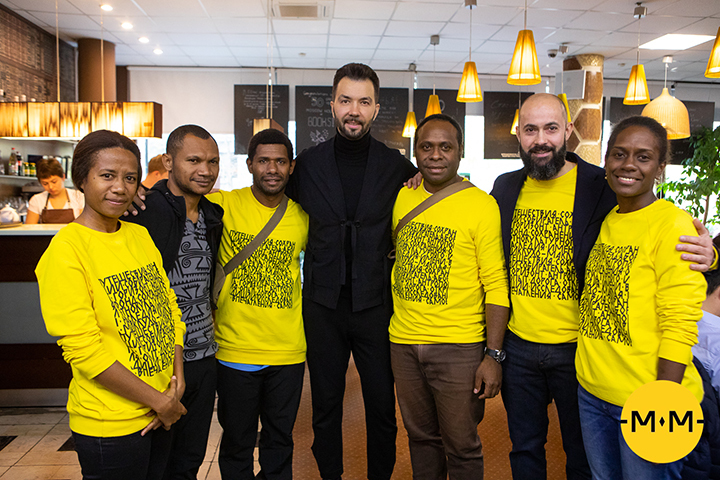 The guests received a warm welcome from teachers and students, who gave them a tour of the school, organized a concert, and admitted our Papuans and Nickolay Nickolaevich as students to one of the best schools of the country. 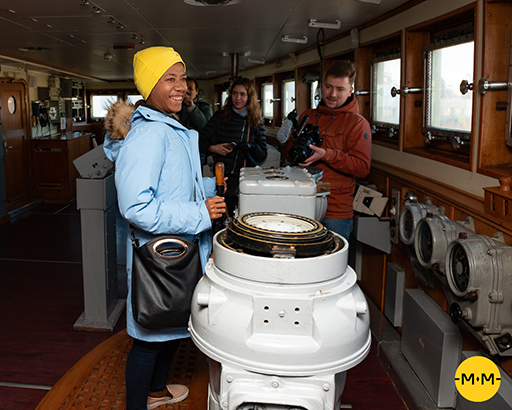 The busy third day concluded by a visit to the place loved by all the residents and tourists in St. Petersburg – the pyshechnaya doughtnut shop, where the guests tasted the legendary Leningrad doughnuts and coffee. 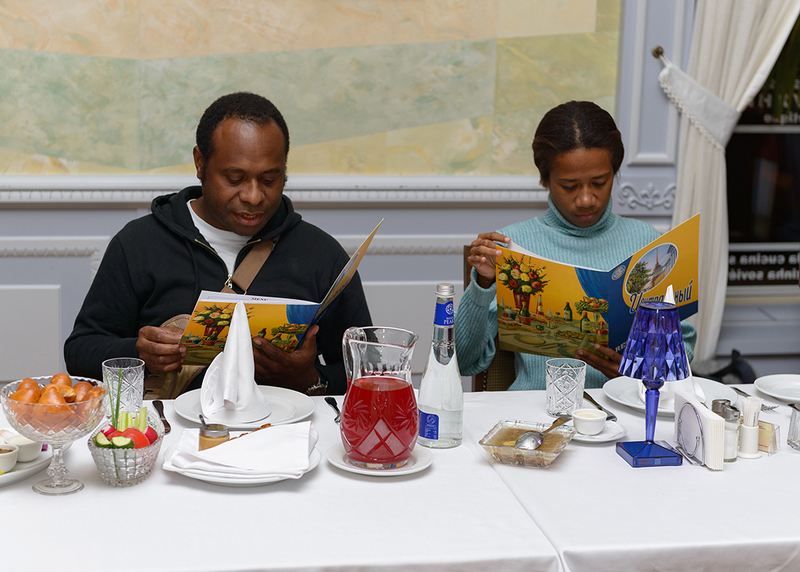 We later found out that this traditional St. Petersburg fast food became our guests’ favourite dish. 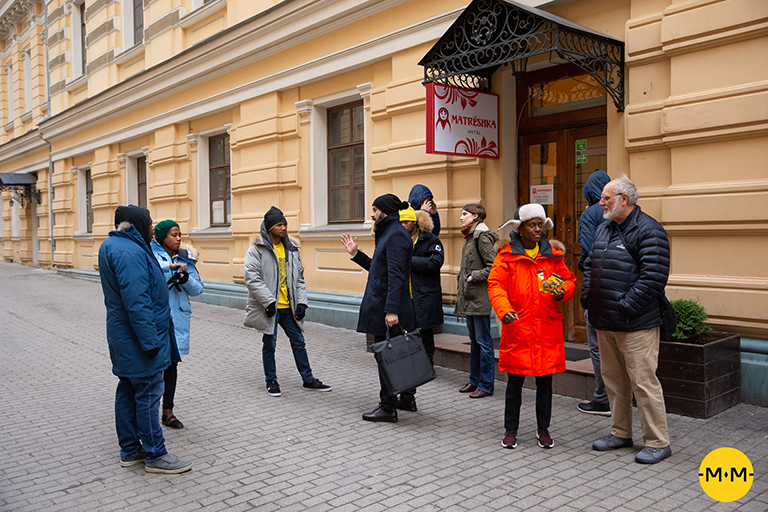 Day four began with a fascinating tour led by Lev Baron – a celebrated guide and a true expert. 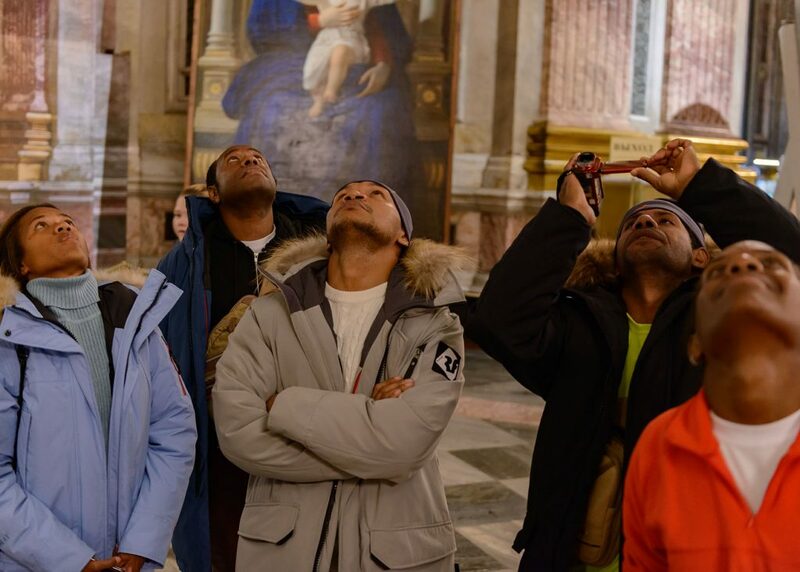 The guests walked around the city, saw the famous Aurora and also visited the flat where the illustrious scholar and explorer N.N. Miklouho-Maclay lived. 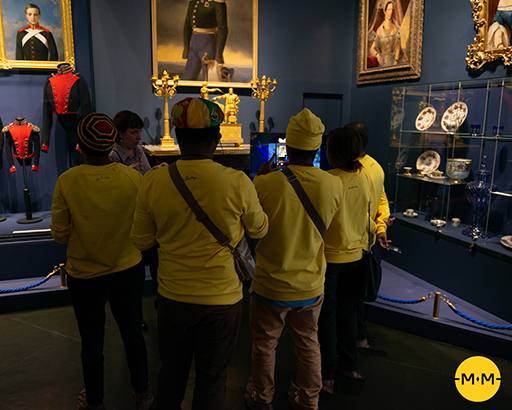 The preserved interior of the flat and its atmosphere helped the guests immerse themselves in history. 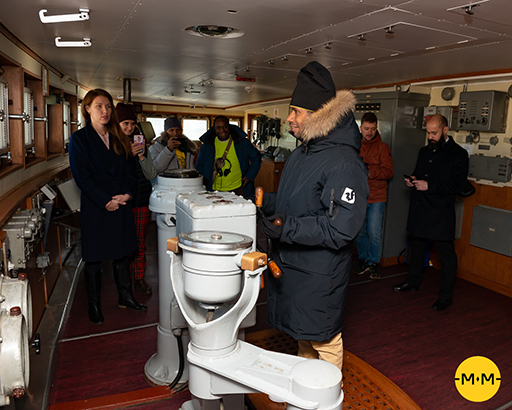 Next they went on a highlight tour of the Krasin icebreaker, a branch of the World Ocean Museum, guided by the Museum’s Director Irina Stont. 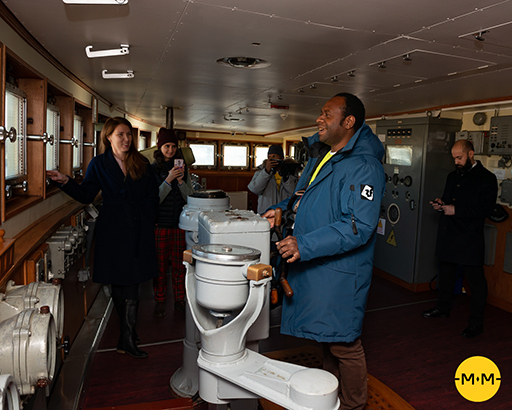 The delegates saw the historic deck and wheelhouse, where everyone could feel like a pilot. 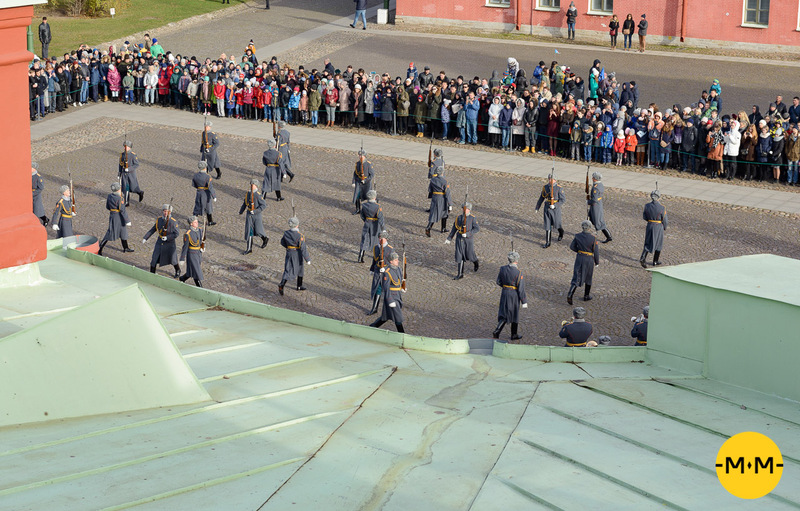 At the end of their tour of the Krasin, the guests saw the Tabir dish brought by N.N. 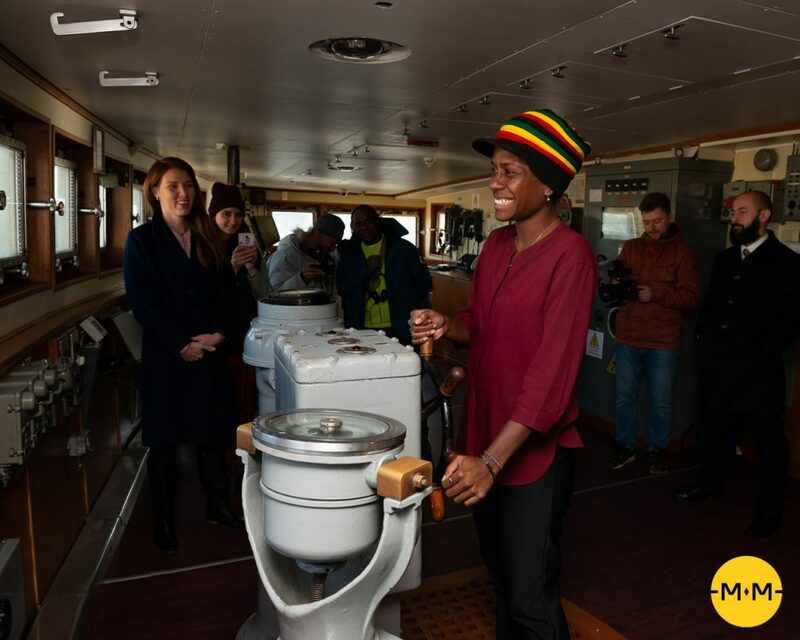 Miklouho-Maclay Junior from the 2017 research expedition to Papua New Guinea that was given to the World Ocean Museum six months ago. The dish is used in rituals that are part of wedding celebrations and boys’ initiation into manhood. 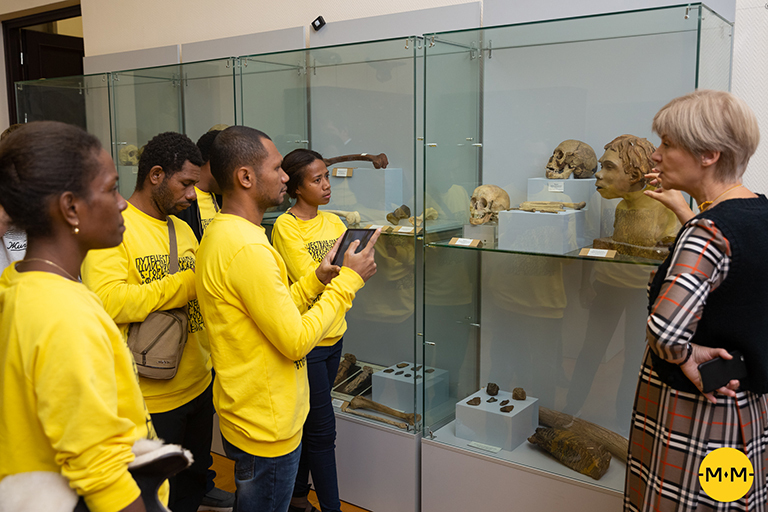 The delegates were amazed to see that an object laden with meaning for their culture was kept thousands of miles away from their home. 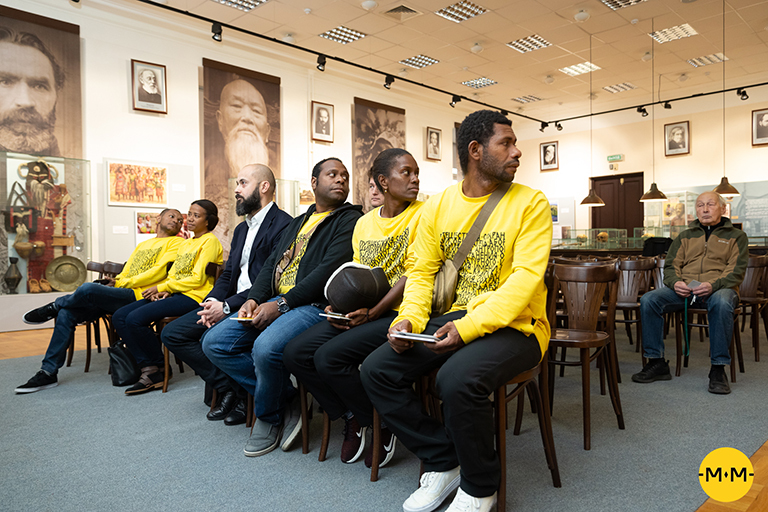 It was a joy to see the museum exhibit light a spark in their eyes and open up their hearts as it let them see that the culture of Papua New Guinea is valued in Russia. This moment brought it home that the collection gathered by the great scholar in the 19th century, and likewise the collection from the 2017 expedition, help to build a bridge of friendship and understanding through the centuries and continents. 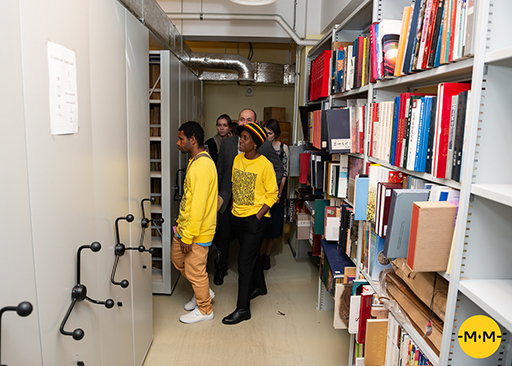 Miklouho-Maclay Junior brought 55 items from the 2017 expedition: 14 of them have been given to the Kunstkamera, the country’s oldest museum, one is kept at the Anuchin Museum of Anthropology within Moscow State University, and 40 objects from Miklouho-Maclay’s private collection have been given to the Miklouho-Maclay Foundation. 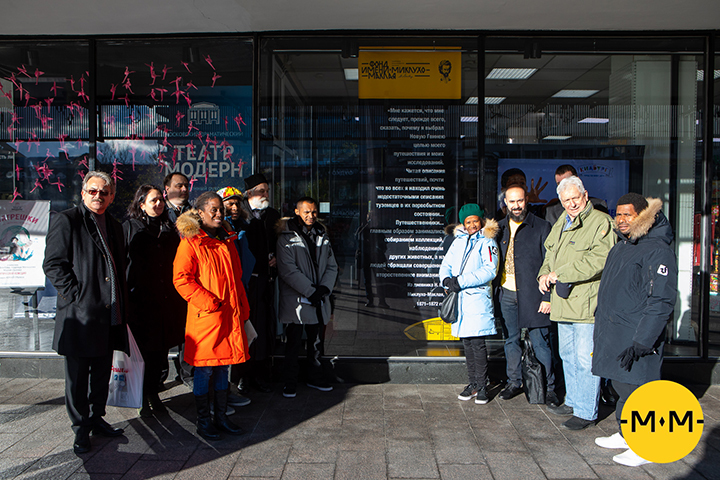 After a welcoming meeting in Krasin icebreaker, delegates went to the “Happy Pushkin” hotel, where the last apartment of N. Miklouho-Maclay Senior is located. 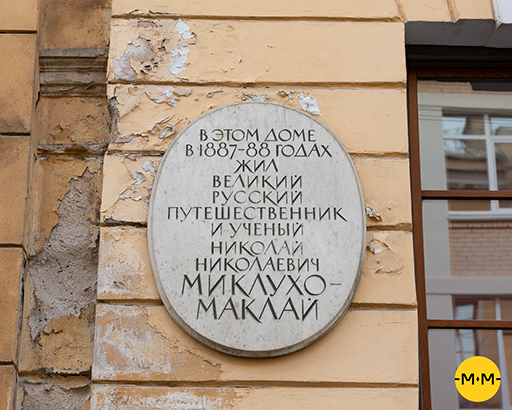 He was living there for the last years with his wife and children in the simple atmosphere in the center of St. Petersburg. 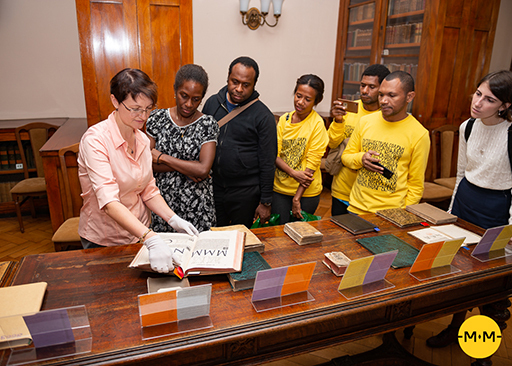 Delegates were very fascinating to look at the original furnishings, which were used by the great traveler, scientist and anthropologist. 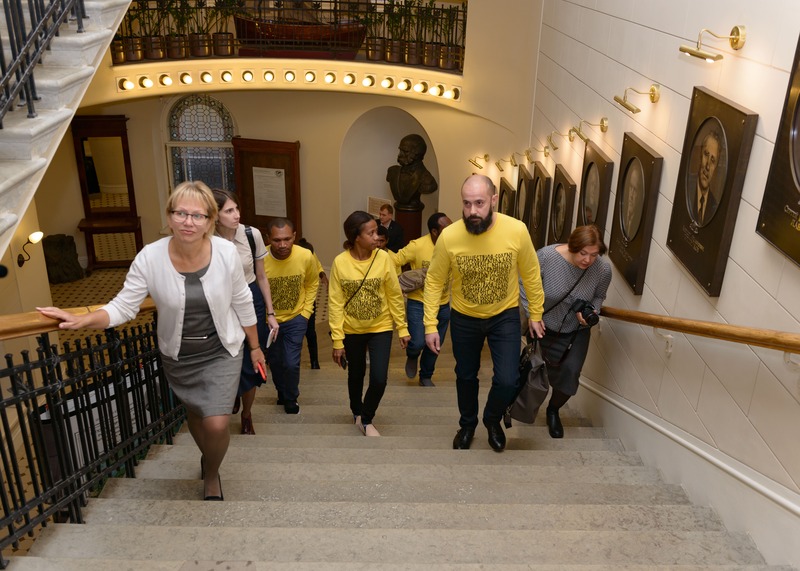 The delegation’s next stop was the heart of St. Petersburg, the place everyone dreams to visit – the Hermitage. 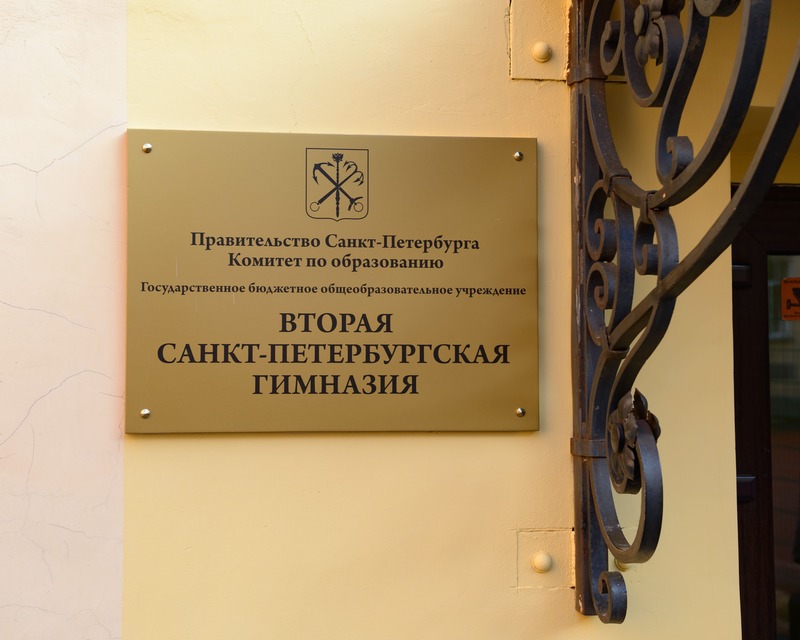 Let us note without false modesty that there isn’t a single person in the world who would not be astonished by the Hermitage. Our friends were not exceptions. 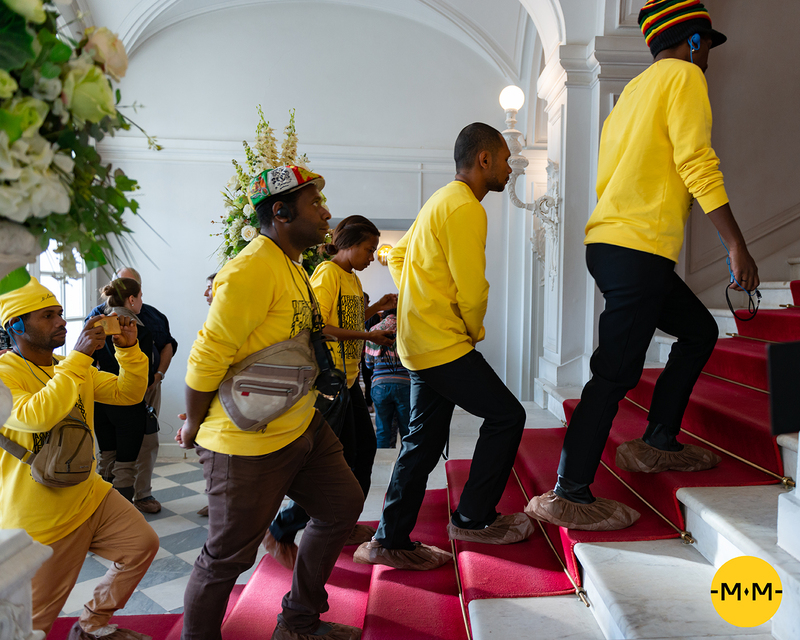 Each of them said that the Hermitage was the best museum in the world that allowed its visitors a glimpse of world history. 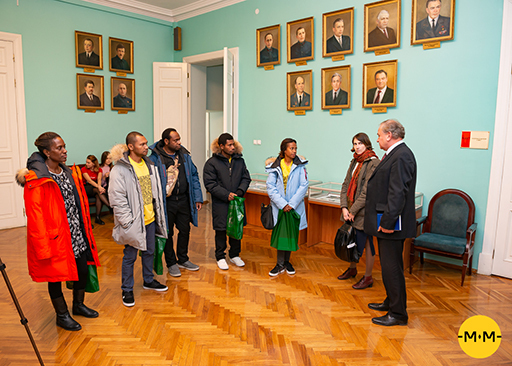 Then the guests from Papua New Guinea visited the St. Petersburg State University of Economics, where they were very glad to meet their colleagues. They had an opportunity to discuss and compare the systems of education in our countries and concluded that the approach to education is the same, but the implementation of technological innovations in Russia facilitates the process. 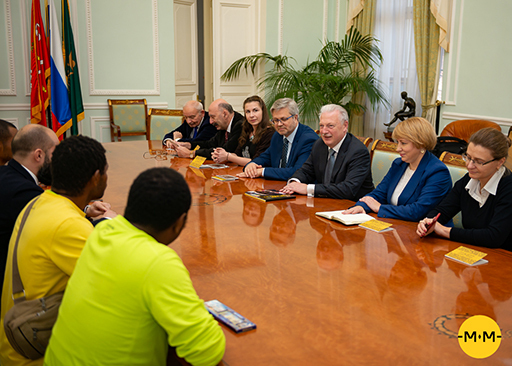 These talks resulted in plans for student exchange and distance learning, and the Miklouho-Maclay Foundation will be providing administrative support for these programmes in association with the universities of Papua New Guinea and Russia. 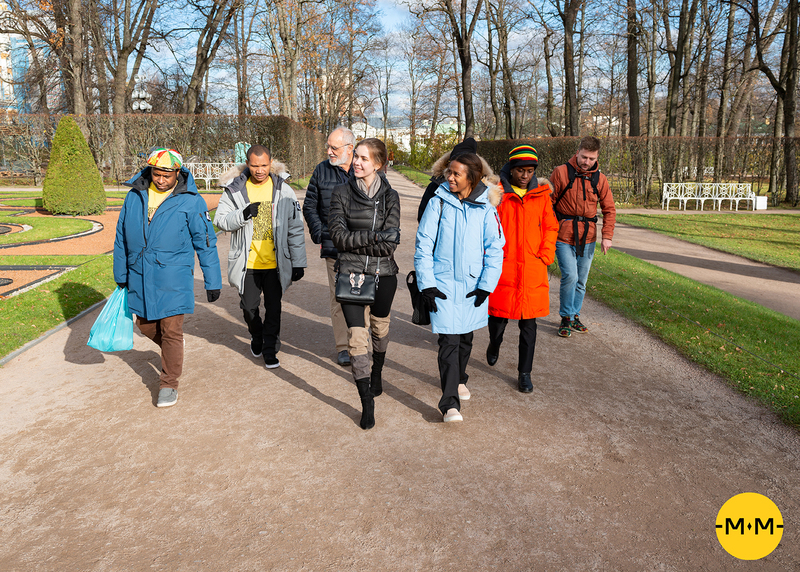 On the fifth day of their stay our guests visited Tsarskoe Selo, the palace and park complex, designated as the world heritage site, in the town of Pushkin. 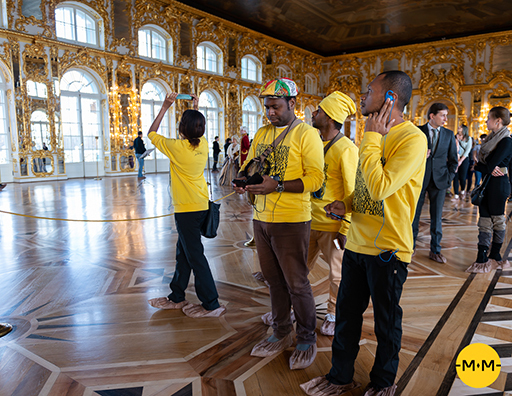 The delegation took a walk along the scenic alleys of the Catherine Park and saw the fabled Amber Room, whose luxurious ornamentation made an indelible impression on the visitors. For the Papuan people, the main and only attraction is the nature itself. 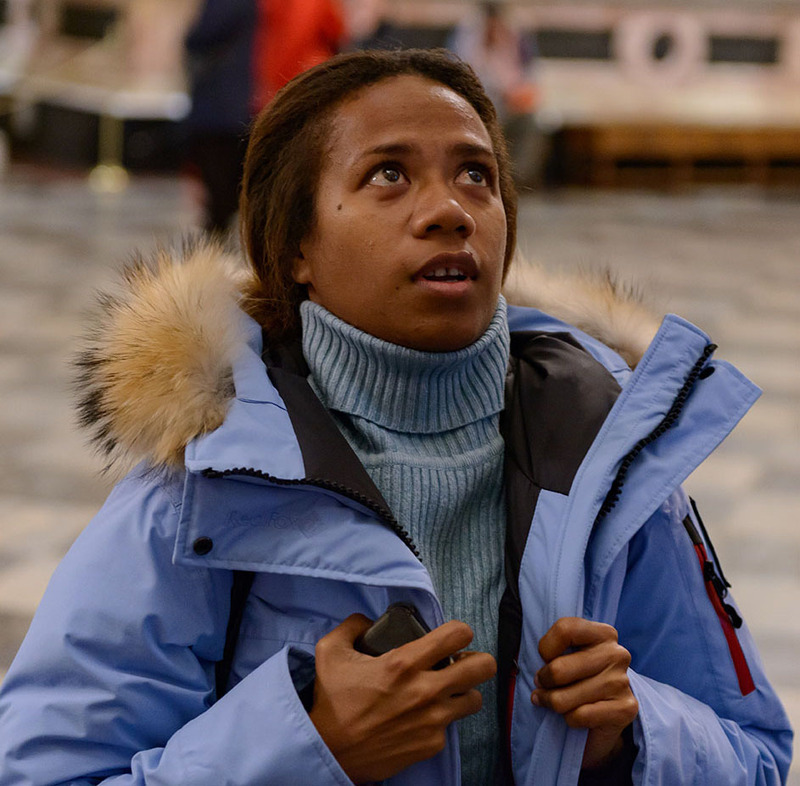 When asked to suggest popular landmarks and points of interest in New Guinea, Laurel refers, without a moment’s hesitation, to the local coastline and adds that, albeit not boasting such spectacular architectural monuments as in Russia, his country enjoys the beauty of pristine, unspoilt nature that every visitor to Papua New Guinea must partake. 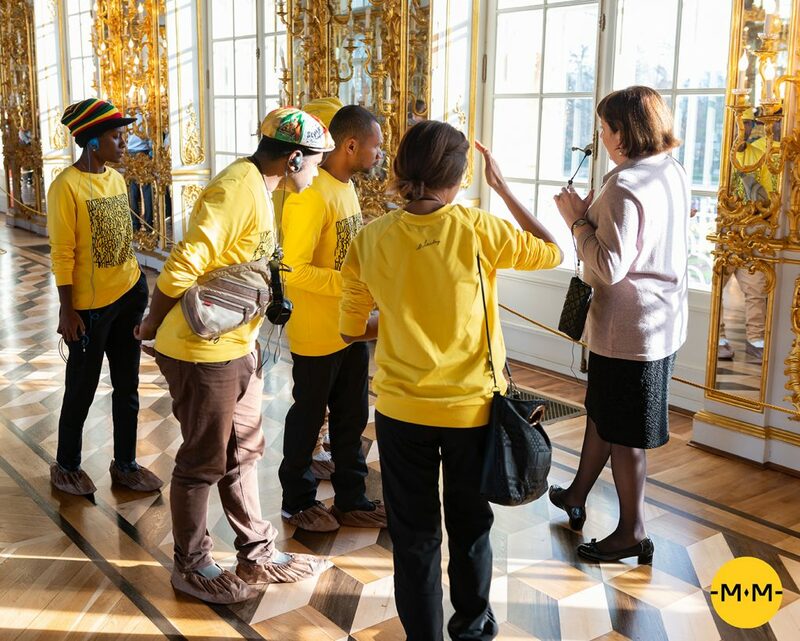 As a memorable gift, the delegation received the amber that was used in furnishing the Amber Room. 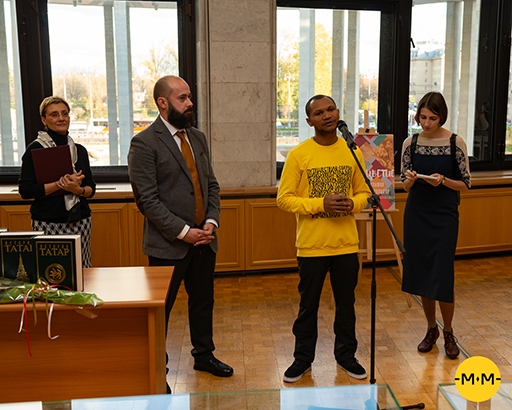 From there the delegation made for the Russian National Library where our guests met with the general director A. Vershinin and library staff members, followed by the official opening of the Cultural and Language Diversity exhibition in which our delegates took part as guests of honour. 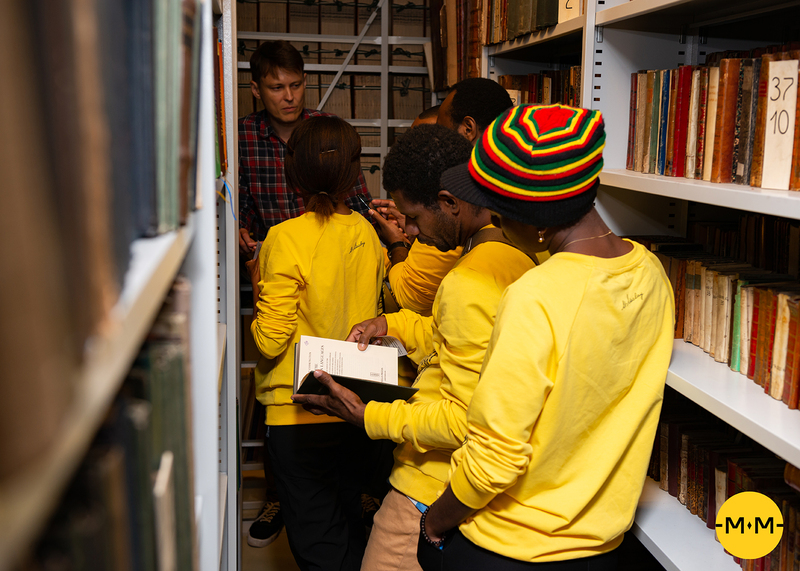 The RNL personnel introduced the guests to the restricted library repository and showcased books written in Papua New Guinean languages. The outcome of the meeting was the signing of a memorandum between the RNL and the National Archive and Library of Papua New Guinea. 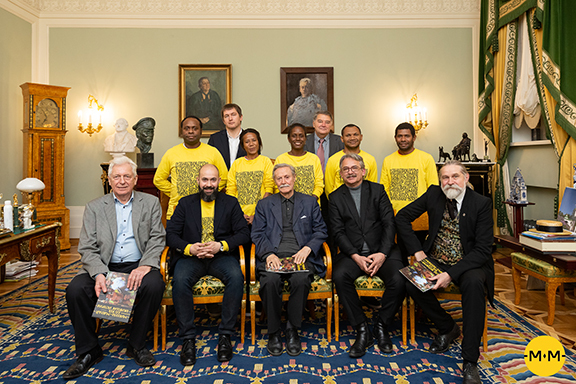 The delegation then went on to take part in a yet another exciting event – a meeting with the Saint-Petersburg Conservatory folklore music group at the Mekhnetsov Folklore and Ethnographic Centre of the Rimsky-Korsakov Saint-Petersburg State Conservatory. 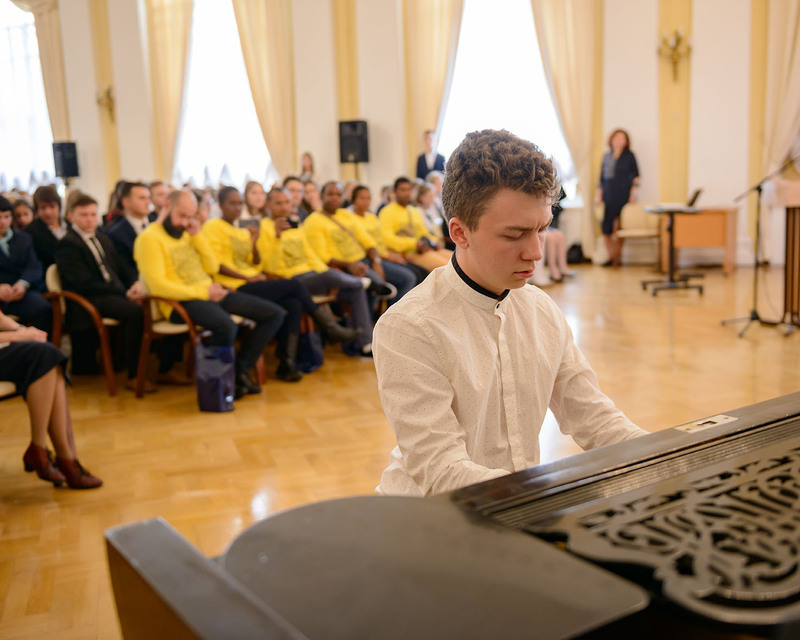 There the delegation was shown unique footage from the 2017 scientific-research expedition to the Rai Coast, heard music of the Oceania islands recorded by the eminent Soviet and Russian folklore and world epic heritage specialist, explorer, Doctor of Philological Sciences B. Putilov, and watched the performance of the Saint-Petersburg Conservatory folklore music group. 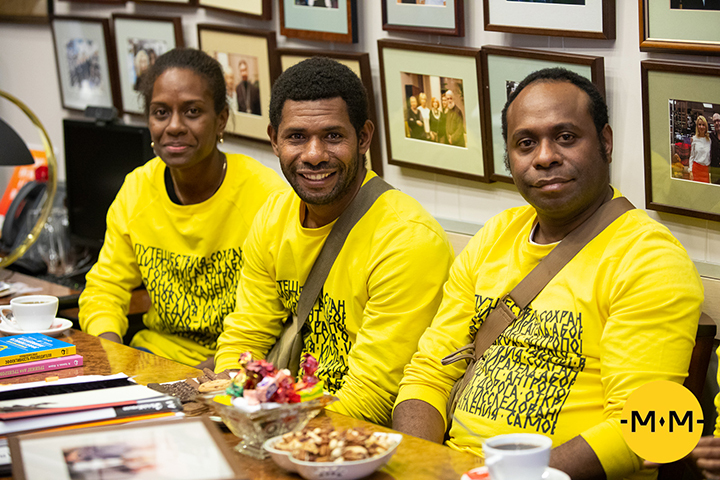 The delegates, in their turn, spoke about their life in Papua New Guinea, about the 867 languages spoken there – which still sounds inconceivable for any Russian. Our fellow citizens find it extremely hard to believe that such a small country can have such variegated means of communication. 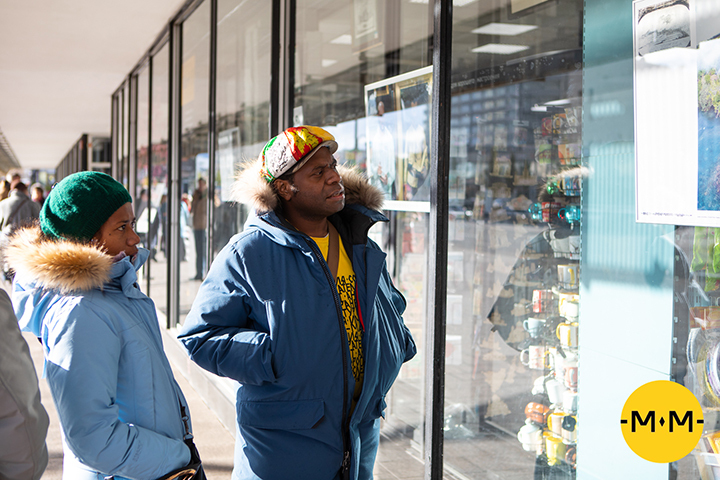 These native tongues, often referred to as dialects, are, in fact, full-fledged languages. The common language at the University is English, while Tok Pisin is spoken throughout the country for social communication. 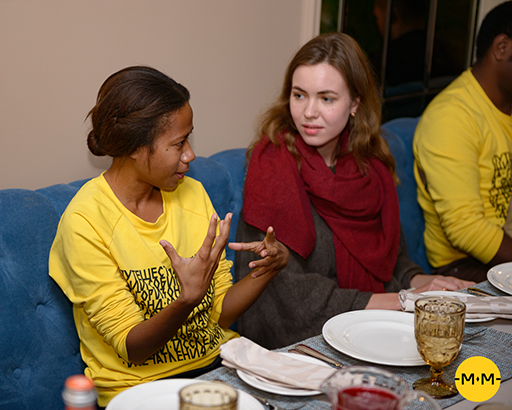 All delegation members can speak two, some of them – even five, national languages, but the only common language they share is English, because otherwise they would simply fail to understand each other. The delegates come from different villages and no one speaks any other commonly shared language apart from English. It is worth noting that the impact of the British Empire and Germany on the history and linguistic makeup of this island state resulted in a large number of loan-words from various European languages. 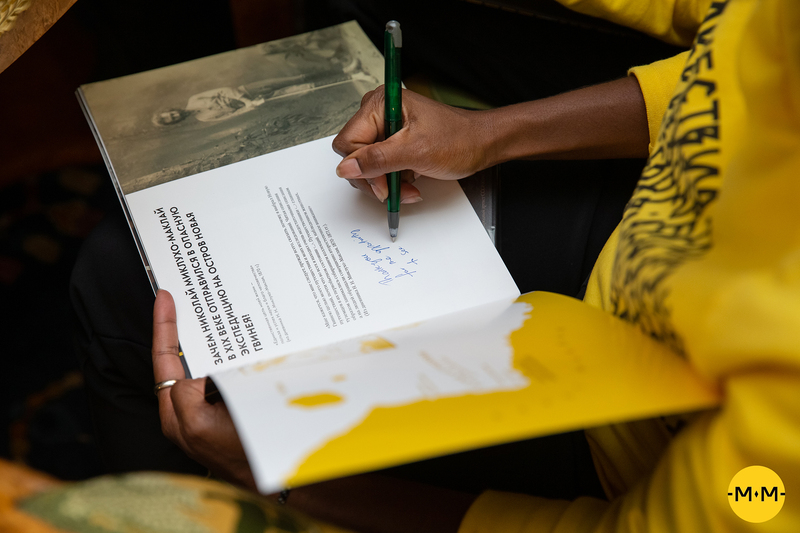 It should be remembered, though, that such words as corn, axe or ox were borrowed from the Russian language owing to our eminent fellow countryman, and many locals name their children Maclay to preserve Miklouho-Maclay’s mark in history. 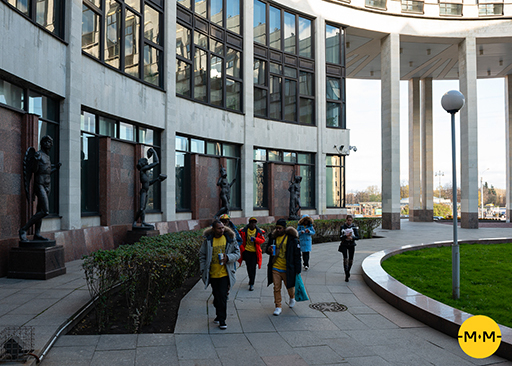 The sixth day of the visit began at the Emperor Alexander I St.-Petersburg State Transport University, where the delegation had a meeting with the university pro-rector, P. Ryubin, faculty staff and students, and negotiated possible venues of cooperation, followed by a tour around the university. 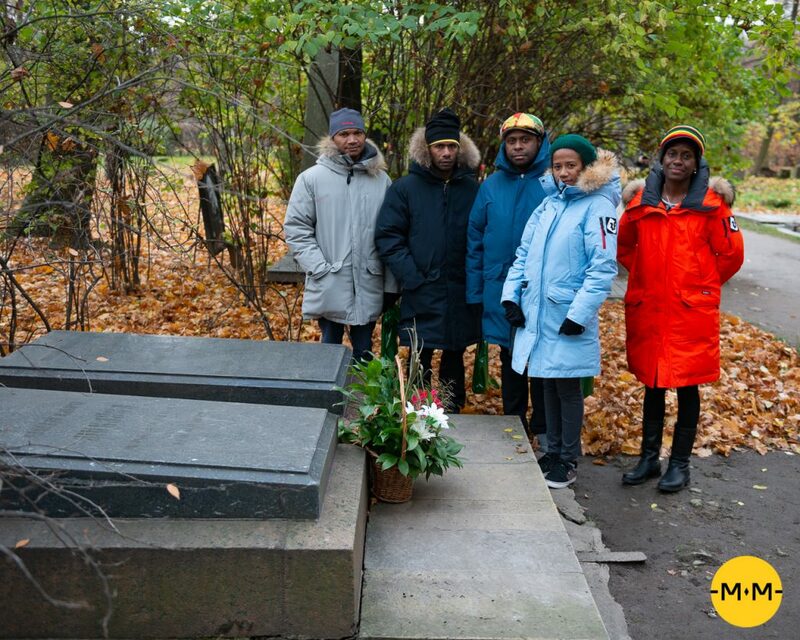 From there, the delegates proceeded to the Literatorskie Mostki (The Writers’ Walkways) cemetery, where they visited Nikolay Miklouho-Maclay’s grave and paid homage to the great explorer and scientist, who continues to serve as a connecting link between our distant countries up to the present day. 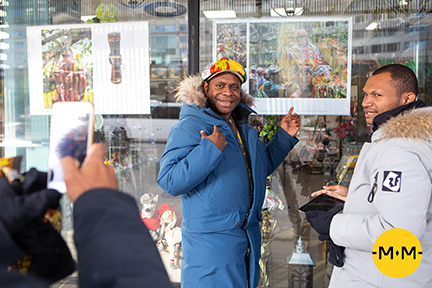 Owing to his efforts, tens of millions of Russians respect the indigenous culture and the people of Papua New Guinea, who once made friends with our explorer despite all the rumours of their bloodthirstiness. 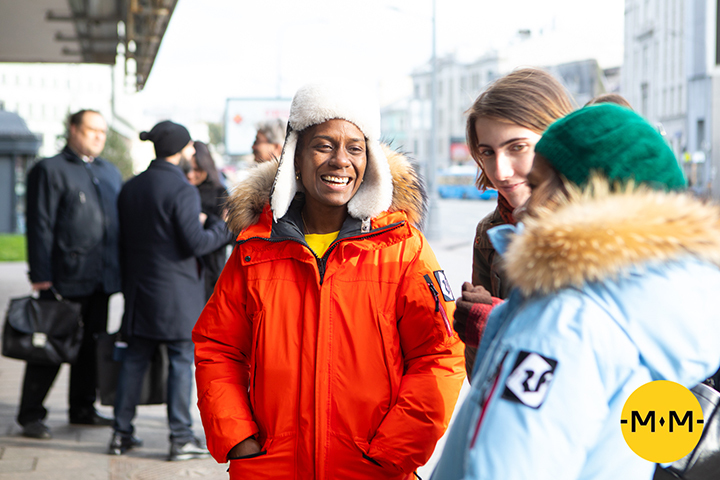 Spending most of the time outdoors, the delegates couldn’t help noticing the Northern Capital’s rigorous climate. 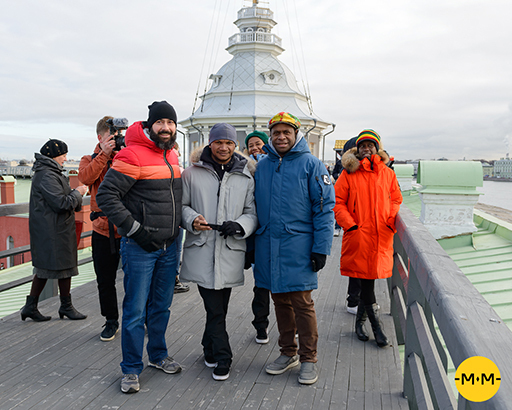 To our surprise, the guests took the rough with the smooth and bore Saint-Petersburg freezing temperatures with fortitude. 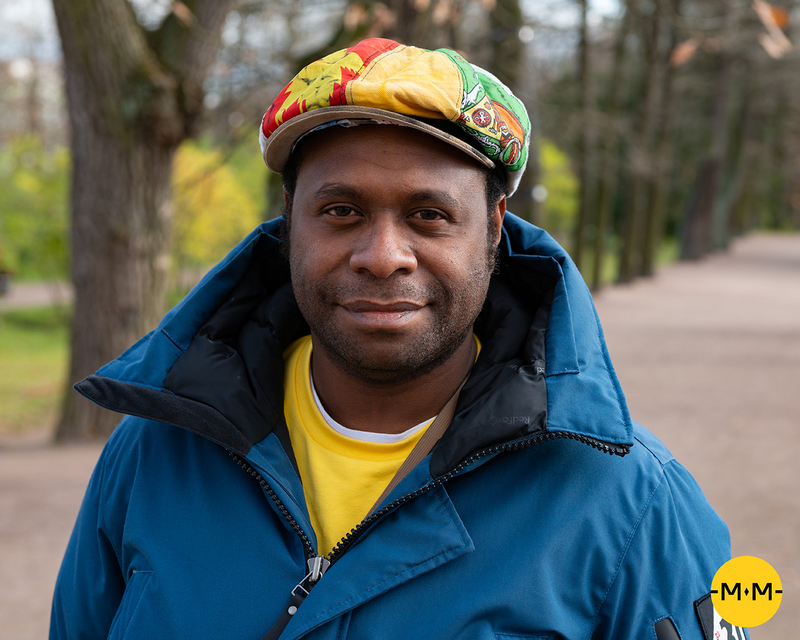 Michael Kabuni, for one, was happy to take a respite from the perpetual 32-degree heat and enjoy a chilly weather, even if for one week. 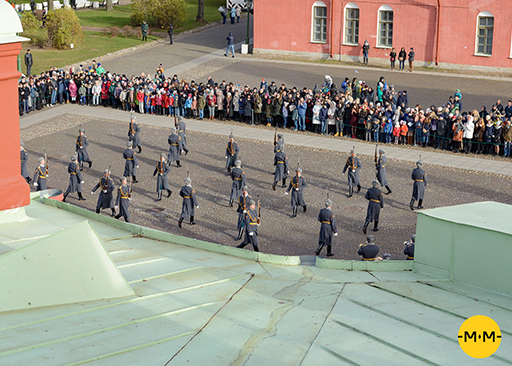 The final day of St.-Petersburg visit started at the Peter and Paul Fortress. 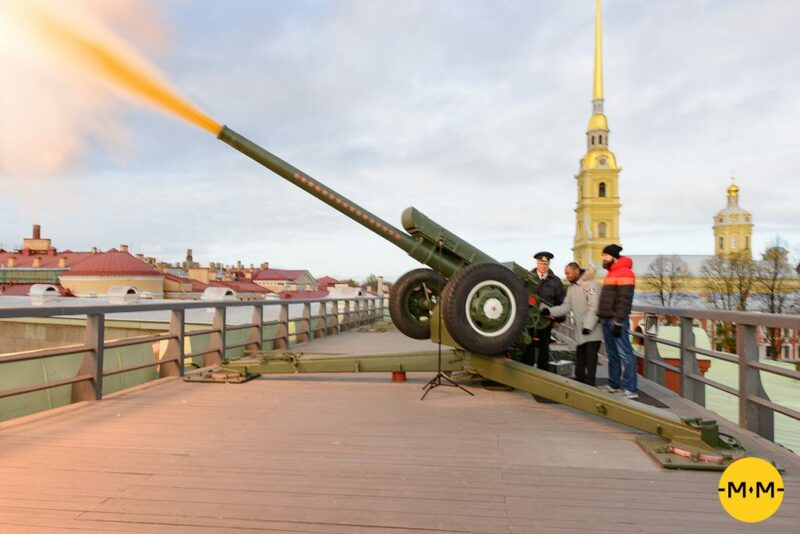 No one expected that our guests would be given an opportunity to fire a symbolic noonday cannon shot from the Naryshkin Bastion! 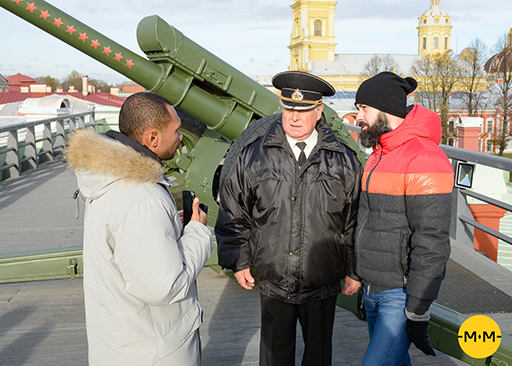 But the historical shot was indeed fired by Michael Kabuni and Nickolay Miklouho-Maclay on the 28th of October, heralding midday for all Saint-Petersburg residents. 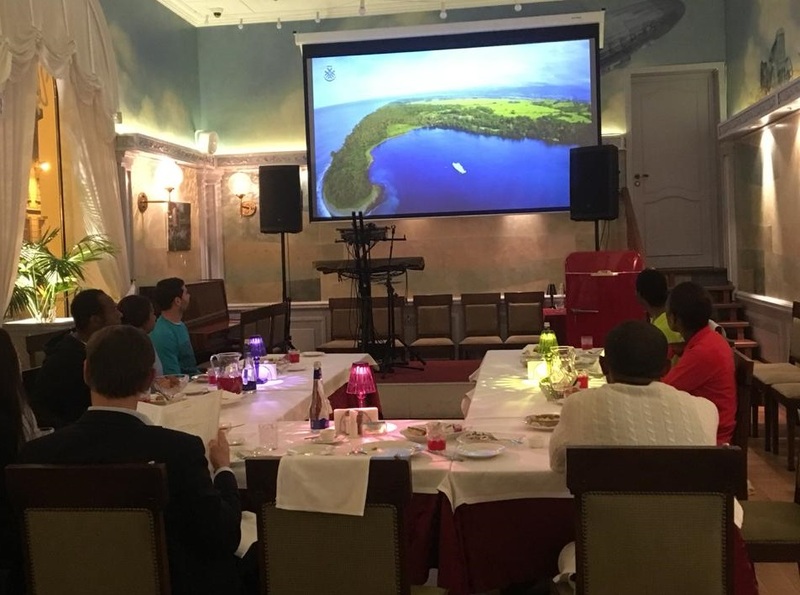 After a sightseeing walk around the city, the delegates went on to attend a gala dinner at a restaurant, where discussions comparing cultures and customs of our respective countries gave way to all things hunting. 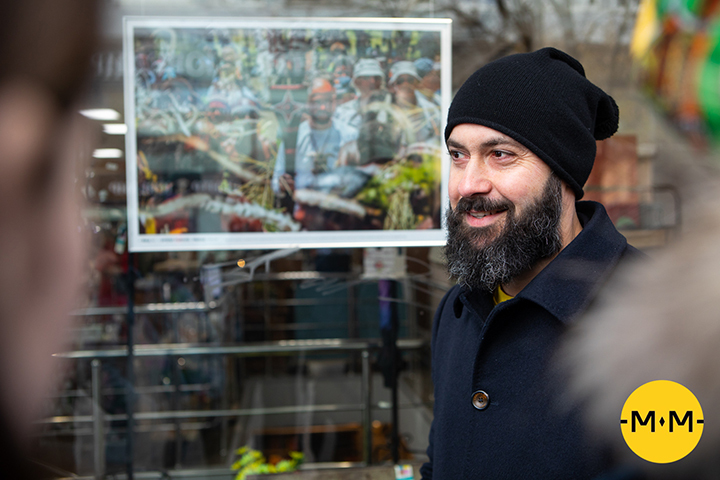 The guests compared hunting techniques and the ways the spoils are split and used. It turned out that wild boar is one of the favourite animals to hunt, both in Russia and in PNG. It should be mentioned that in PNG a wild boar, or a pig, is a symbol of wealth – this animal is represented on the national PNG currency, kina. It is customary to give a wild boar as a gift to the bride’s family during the bride purchasing ceremony, a long-lasting but now purely symbolic tradition. As the delegates noted, this helps bind two families together and they become one single whole. Russel, for instance, mentioned that there are no wild boars in his native village, but instead they have crocodiles whose meat – sweet and tender, resembling chicken – is quite popular among villagers. 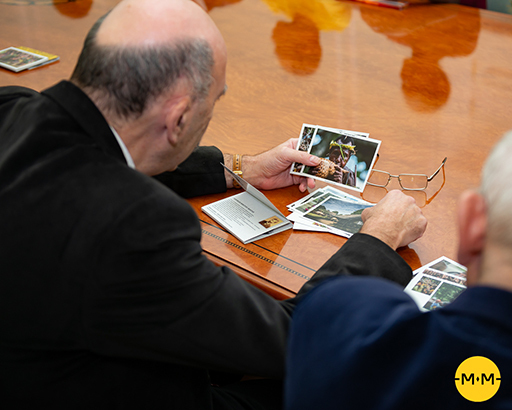 Elaborating upon the culinary subject, the delegates noted that coconuts are probably the most common type of food product. They add coconut in every dish they possibly can and drink coconut milk as well. Interestingly, only green, immature coconuts are used to obtain milk, whereas ripe, brown-husk coconuts are used for cooking. As Betty notes, every true PNG local must know how to crack open a coconut. 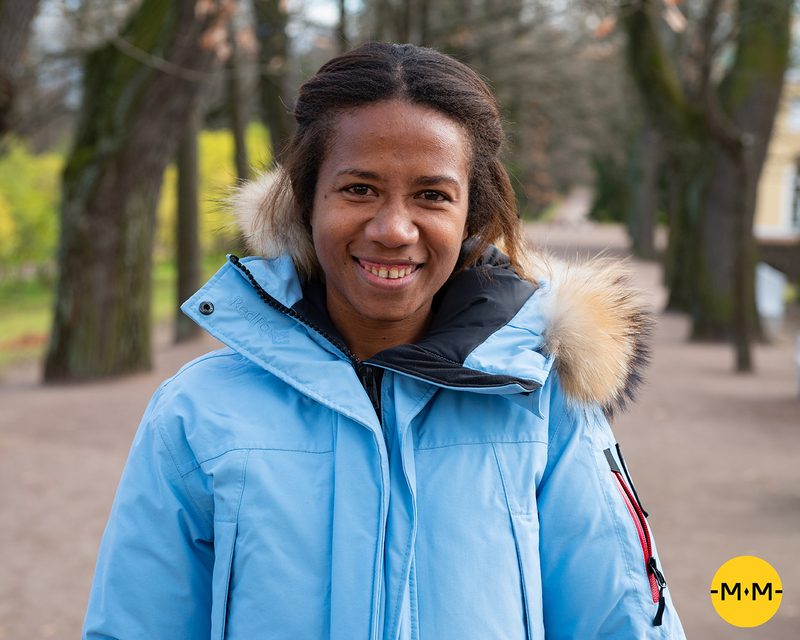 This skill stays with you forever, even if you were to spend some time in a different country and then came back. 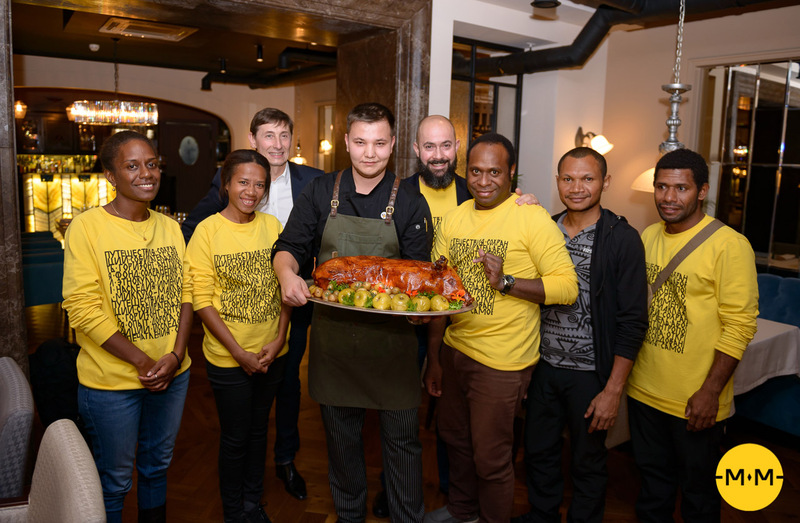 Imagine the astonishment and delight of our guests, when in a restaurant of Saint-Petersburg traditional cuisine, at Fontanka Street 30, they were served with a real roasted pig! 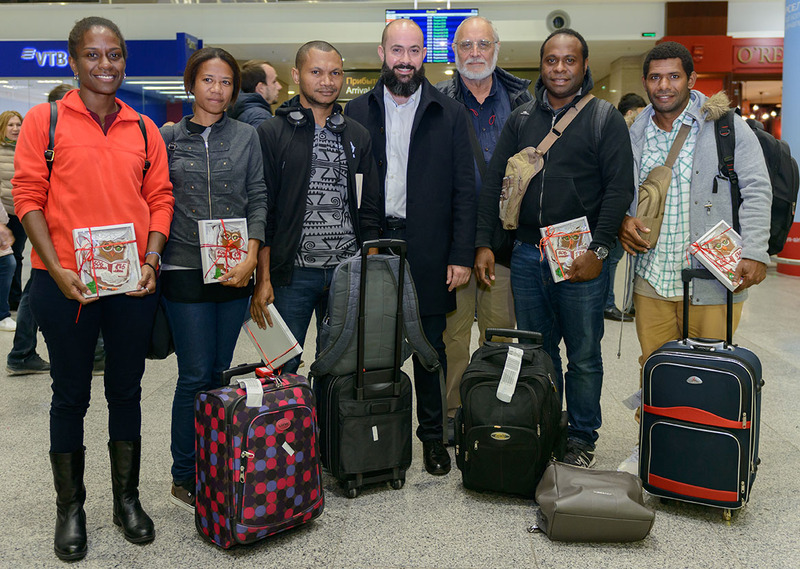 That’s the moment when you realise that Russian and Papuan traditions have much in common! 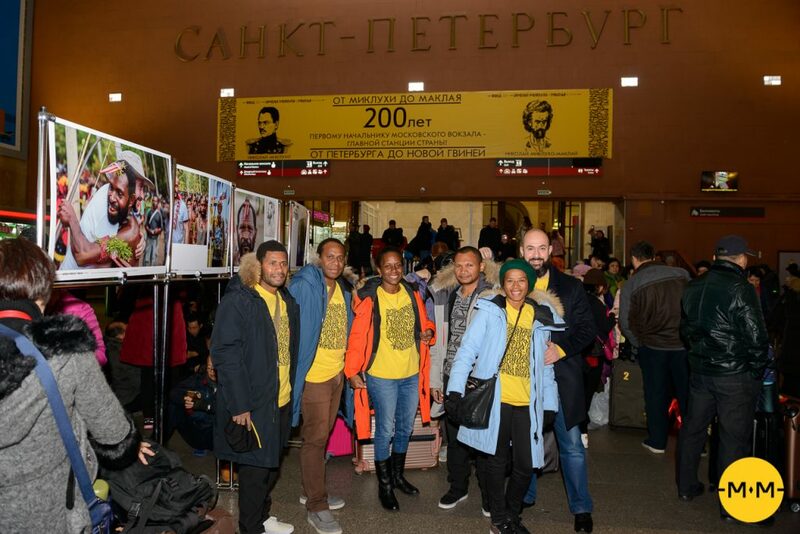 After the gala dinner, the delegation arrived the Moscow train station to witness yet another surprise – an exhibition From Miklouha to Maclay, set up to mark the 200th anniversary of Nikolay Ilyich Miklouha’s birth, who was the father of the great explorer, a celebrated railroad worker and the first Moscow train station master in the Russian Empire. 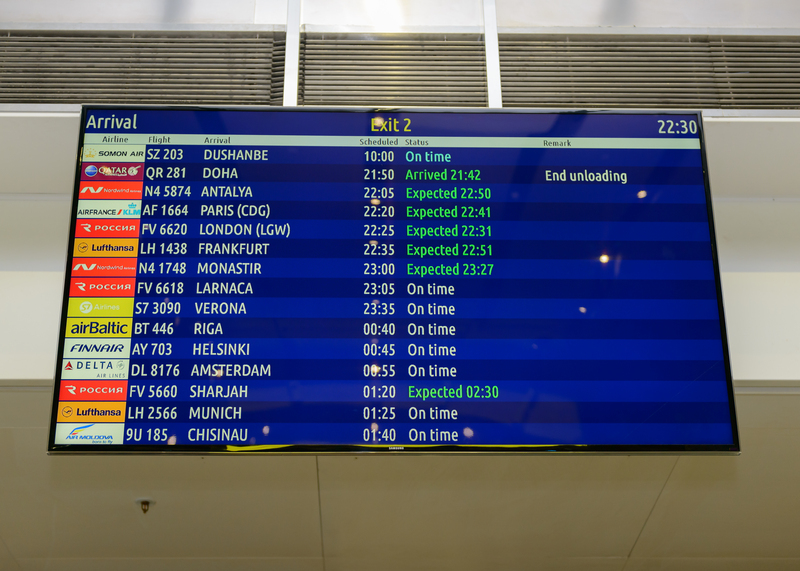 A 12-meter-long poster with the logo From Saint-Petersburg to New Guinea accompanied our friends on their departure to Moscow. It is noteworthy that there are no railroads in PNG and this train journey was the first one our friends have ever made. 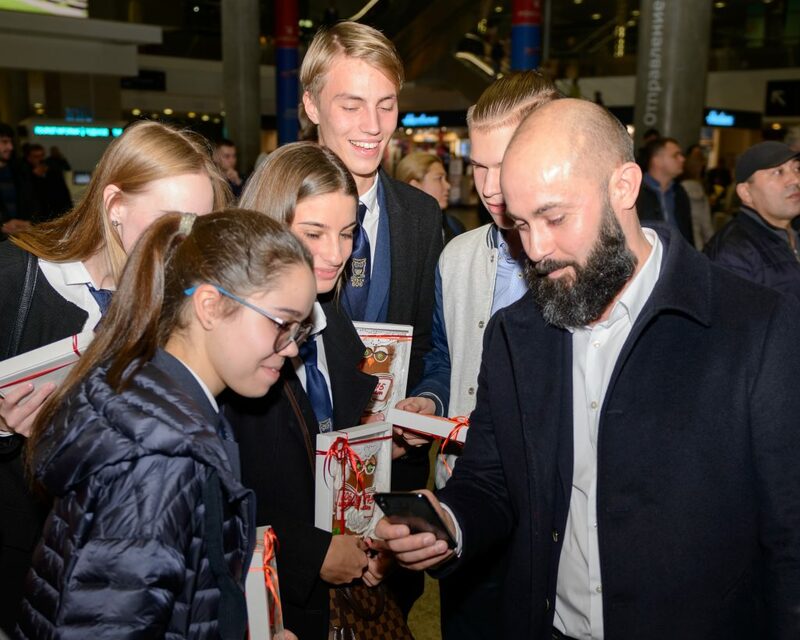 Yet another surprise was awaiting our guests on the departure platform – a Russian national folk song and dance group, Sudarushkha, which offered bread and salt to the delegates as a traditional symbol of hospitality. 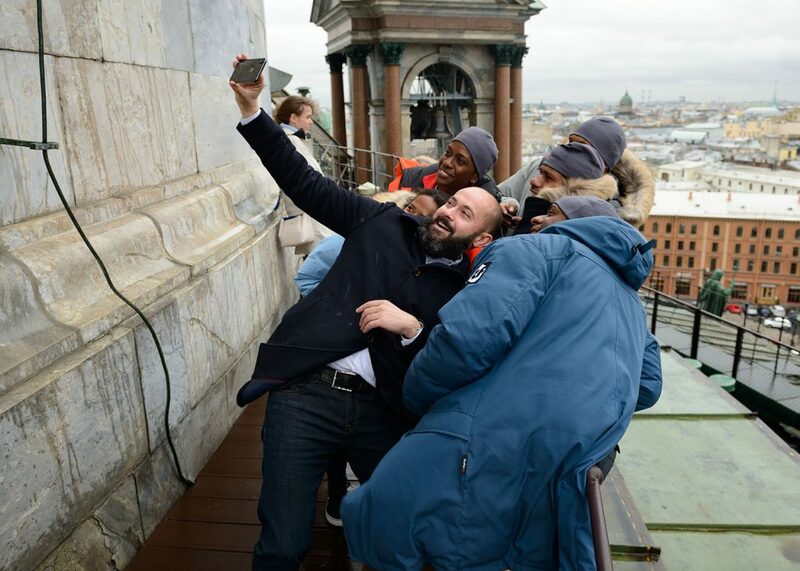 The first day in the Russian capital began with visiting the most celebrated attraction in Moscow, the Red Square. 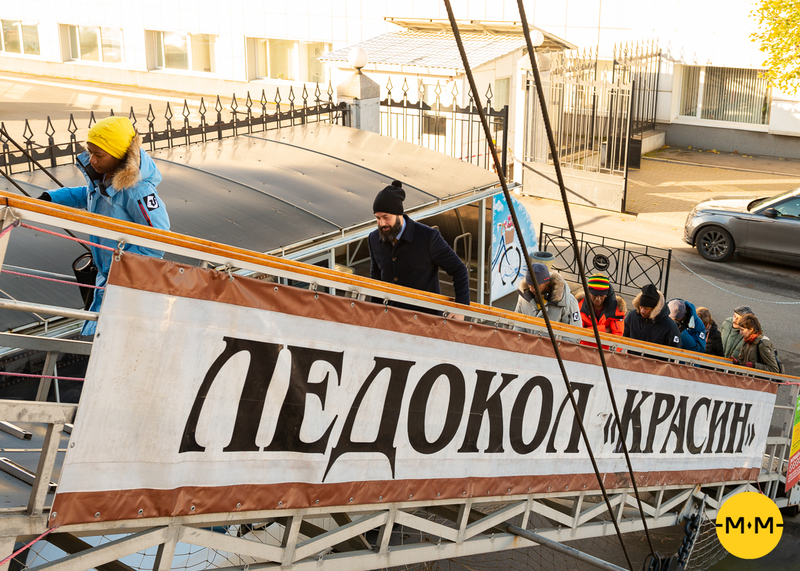 The delegated took a walk around the historical area of Kitay-gorod, saw a graffiti portrait of Nikolay Miklouho-Maclay, painted on the façade of one of the Slavyanskaya Square buildings in early November 2016, and visited a “soaring bridge” in Zaryadye Park which opens up a spectacular vista of the city. 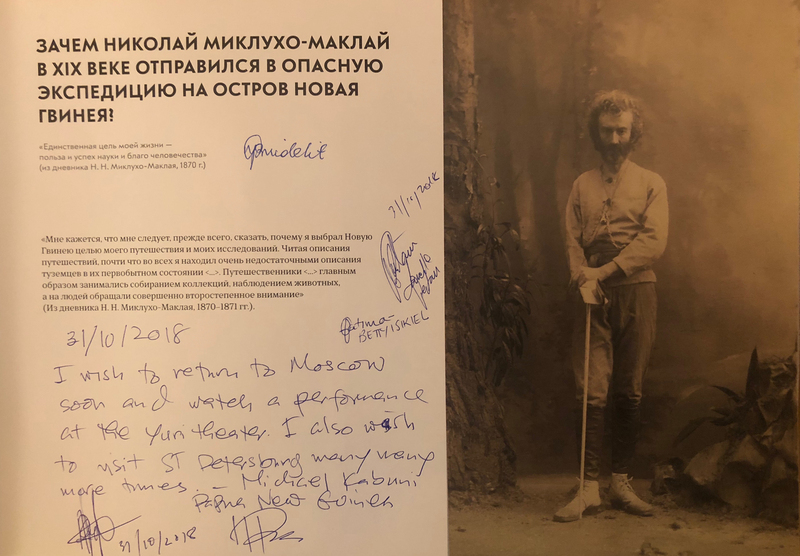 The delegation then strolled down the famous Arbat Street and followed it up by the visit to the Moscow Book House to attend the Miklouho-Maclay. XXI century. 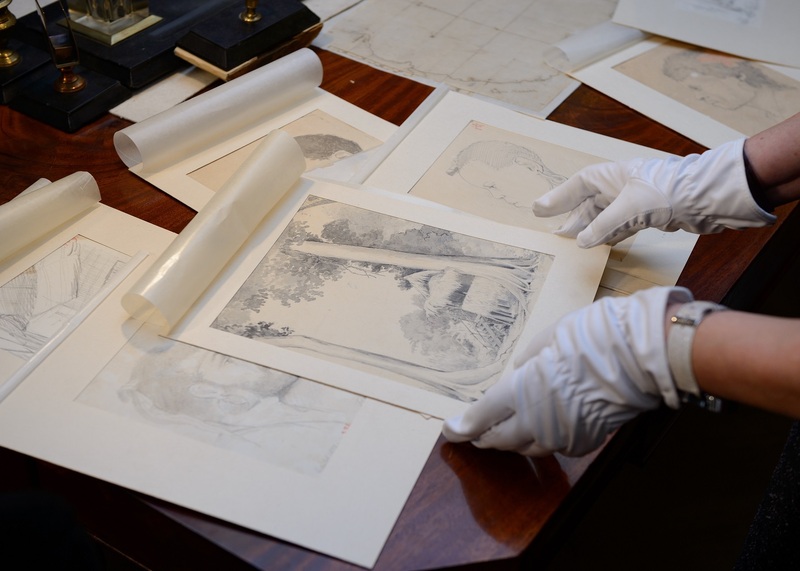 Revived History exhibition that traces Maclay’s XIX and his descendant’s XXI century journeys, showcasing historical copies of original drawings and photographs. The guests were also given an exciting tour around the Book House and shown an edition of A Journey to the Maclay Coast, the English version of which, together with the exhibition, will be officially presented in Port Moresby during the APEC 2018 summit. 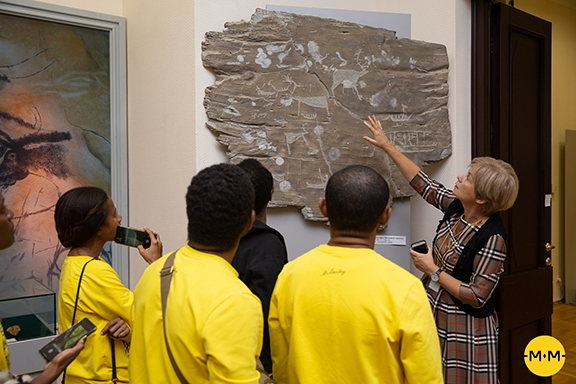 On the second day of their stay, after a walk around the city, the delegates visited the Anuchin Anthropology Research Institute and the Museum of Anthropology of the Lomonosov Moscow State University, where they were greeted by the museum staff headed by the director, Alexandra Buzhilova. 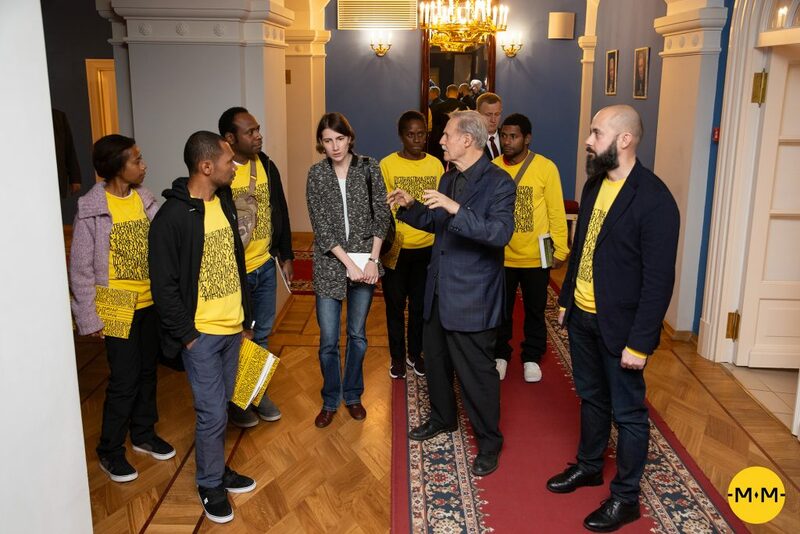 From there, the delegation proceeded to the Ministry of Foreign Affairs of the Russian Federation, where the guests were also given a tour and shown around the office of the Minister of Foreign Affairs, Sergey Lavrov. The delegates were able to soak in the beautiful views from the 26th floor in the very heart of the city. 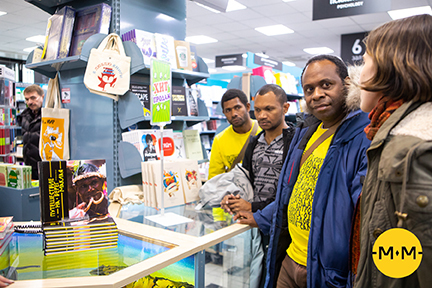 The third day had an eventful programme in store. 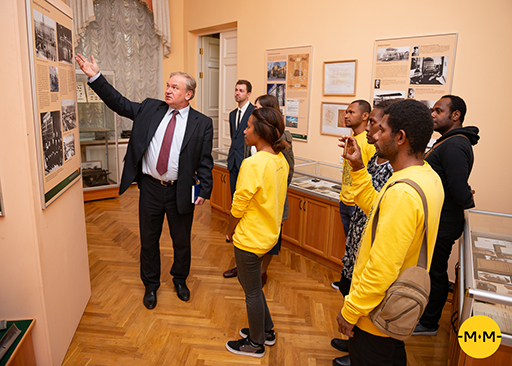 The delegates visited the Miklouho-Maclay Institute of Ethnography and Anthropology of the Russian Academy of Sciences, where they were given a tour around the museum and had a chance to talk to those who know the history of the Rai Coast better than anyone else – and indeed, it was the Institute staff members, headed by D. Tumarkin, who prepared a 6-volume Russian edition that systematises all facts and materials contained in Miklouho-Maclay’s diaries and offers illuminating insights into the history of north-eastern part of New Guinea. 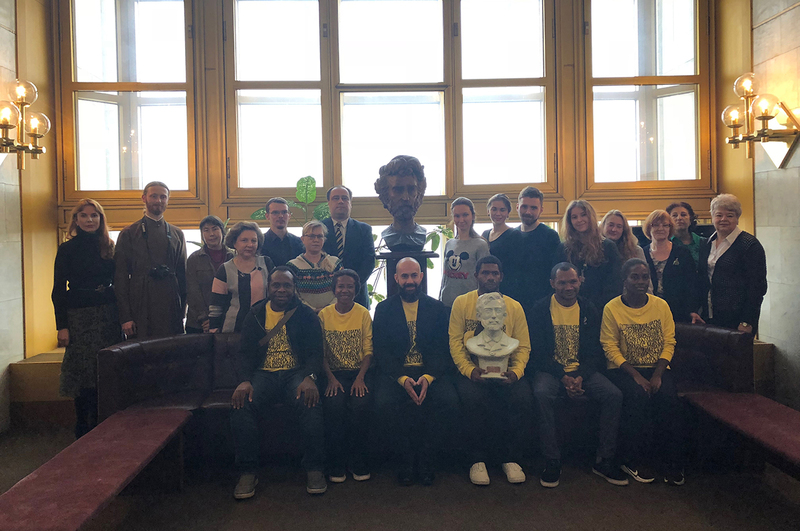 The Institute staff presented the delegation with a bust of Miklouho-Maclay – at last, a precise replica of the great explorer will be brought to Papua New Guinea and exhibited in its capital, Port Moresby, at the University of Papua New Guinea. 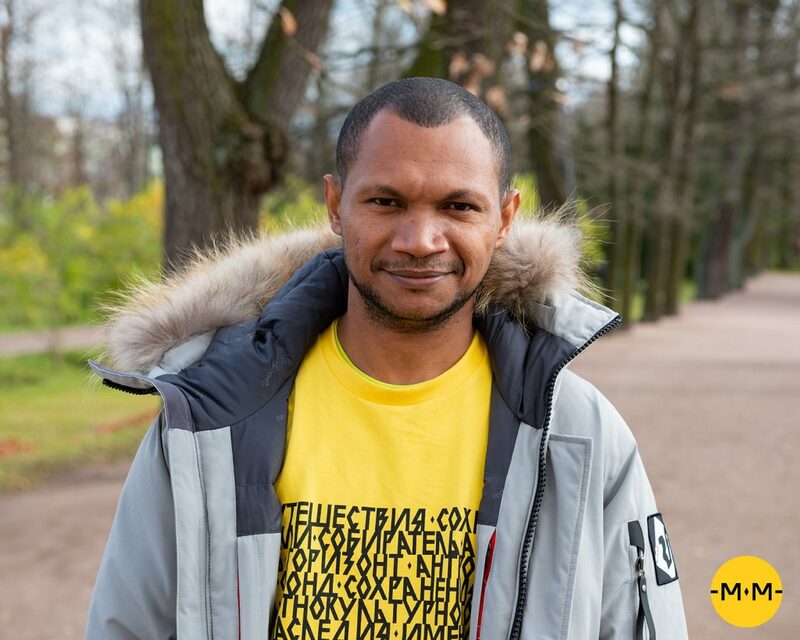 This was followed by a press conference at the Interfax news agency, attended by head of the Okulovka municipality, Sergey Kuz’min. 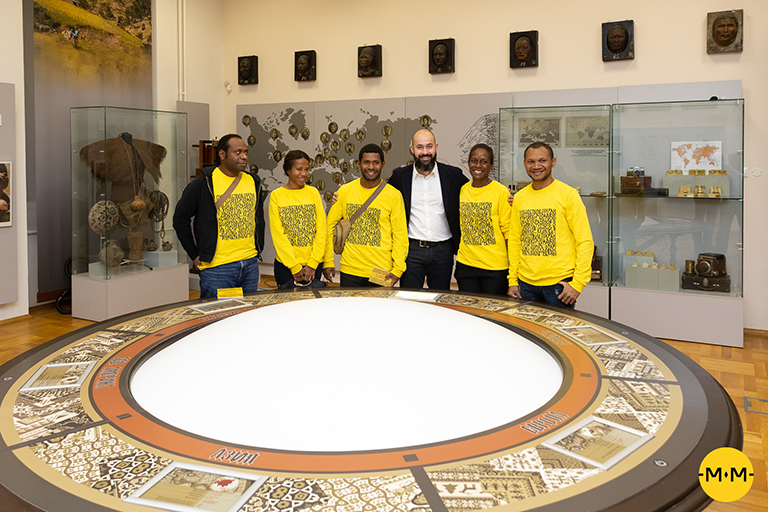 Unfortunately, owing to an extremely tight schedule and busy agenda in Moscow and Saint-Petersburg, the delegation didn’t have time to visit the town of Okulovka – Miklouho Maclay’s birthplace. 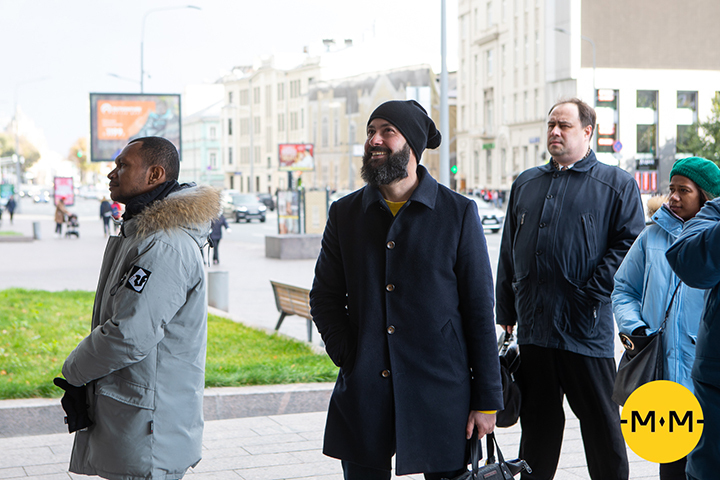 Instead, Okulovka “came to visit the delegation” itself. 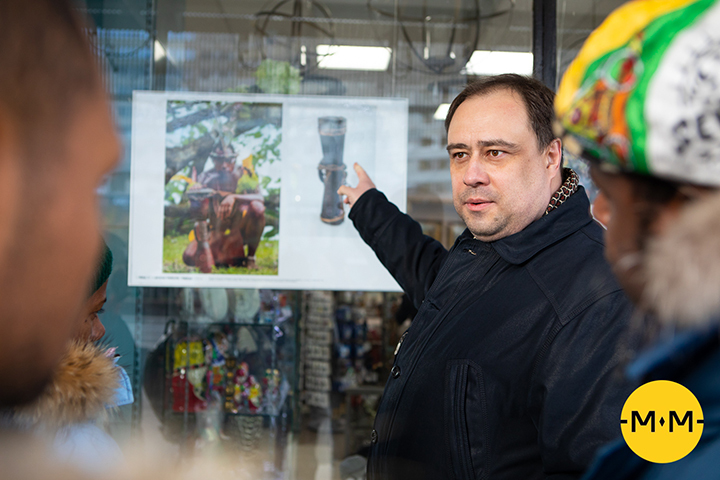 Sergey Kuz’min presented the delegates with a photograph of the monument to Nikolay Miklouho-Maclay in Okulovka, an encyclopaedia of the Okulovka district, as well as photographs taken during Nickolay Miklouho-Maclay Junior’s visit to Okulovka on the Town Day. 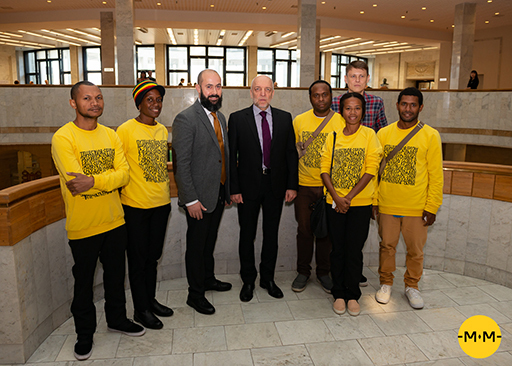 Malenko, a representative of Rossotrudnichestvo – a Russian federal cultural agency that helped organise the visit for the delegation – expressed his gratitude to the Foundation and willingness to sign an agreement creating distance learning opportunities in Papua New Guinea through the assistance of the Miklouho-Maclay Foundation. 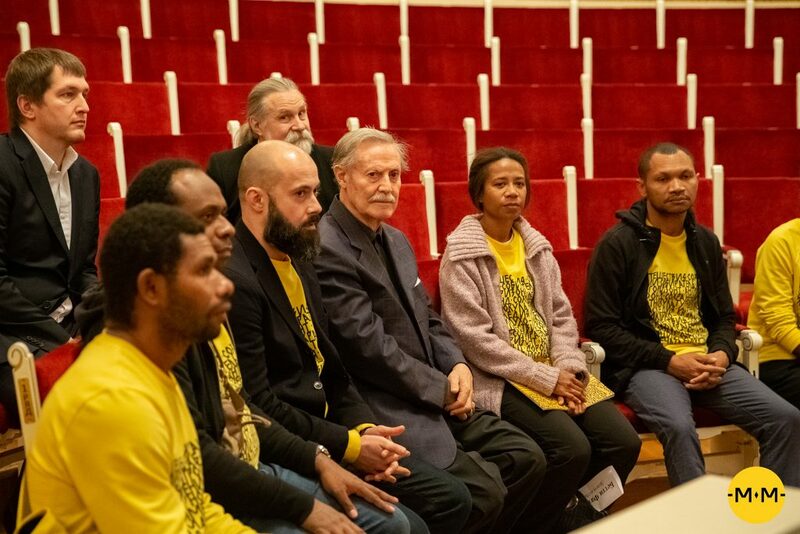 The press conference was followed by a visit to the State Academic Maly Theatre and a meeting with Yuri Solomin, an actor and stage and film director who has put in enormous amount of effort to preserve and promote the achievements and humanistic ideas of N. Miklouho-Maclay. 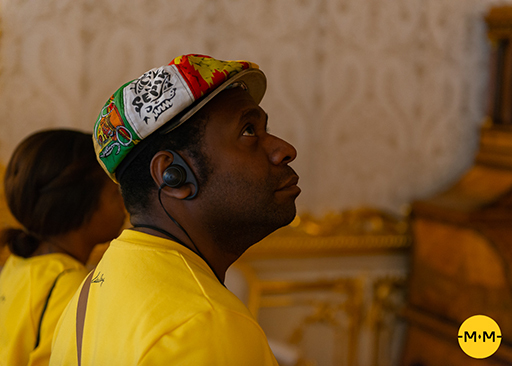 He is also the director and the leading actor in The Coast of his Life — a film, dedicated to N. Miklouho-Maclay. 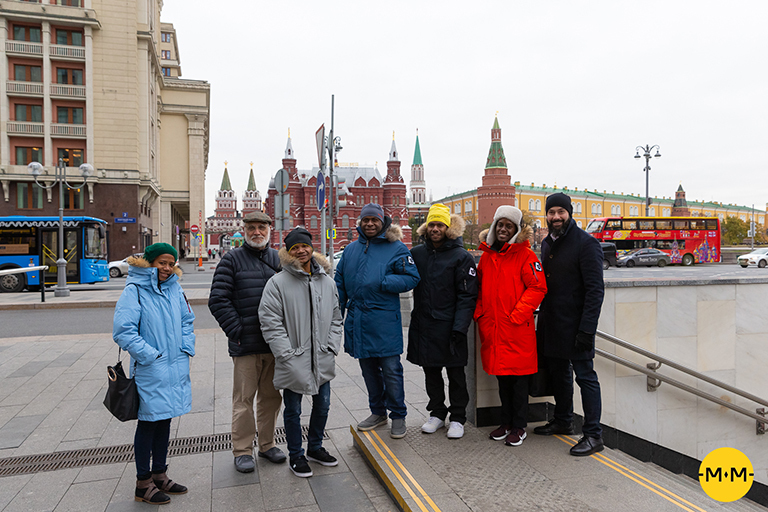 Yuri Solomin showed his guests around the theatre and presented gifts to take home with them — ushankas (Russian fur hats with ear flaps). 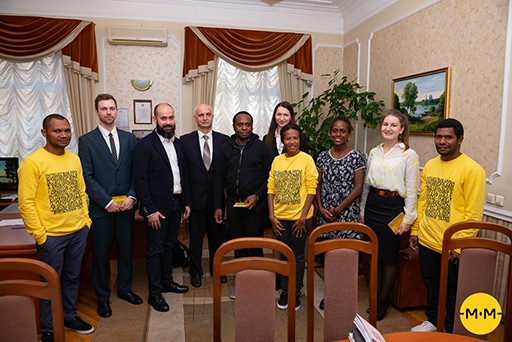 The meeting was also attended by the Adviser to the Minister of Culture M. Kozhemyakin and prominent public figures, supporting the Foundation programmes that are aimed at strengthening cultural and scientific ties between the countries. 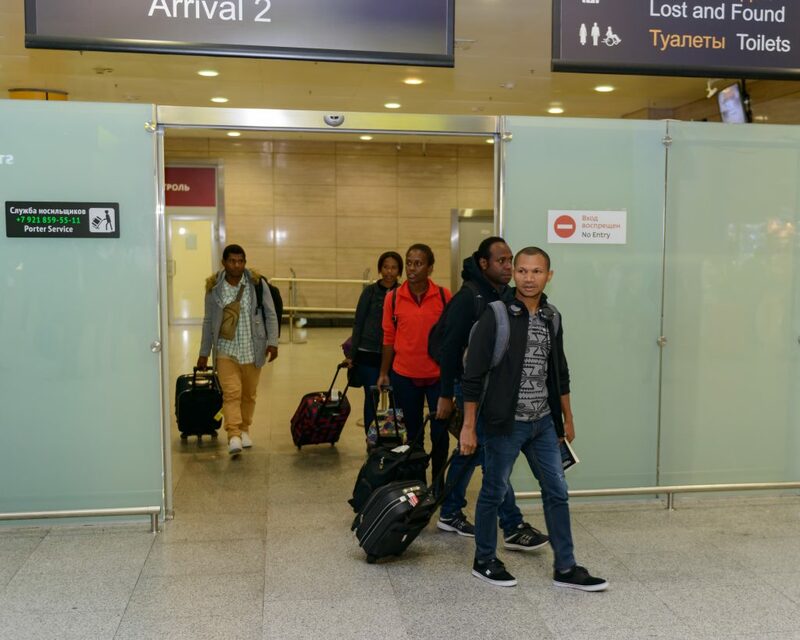 The 31st of October 2018 was the day we bade farewell to the New Guinean delegation. 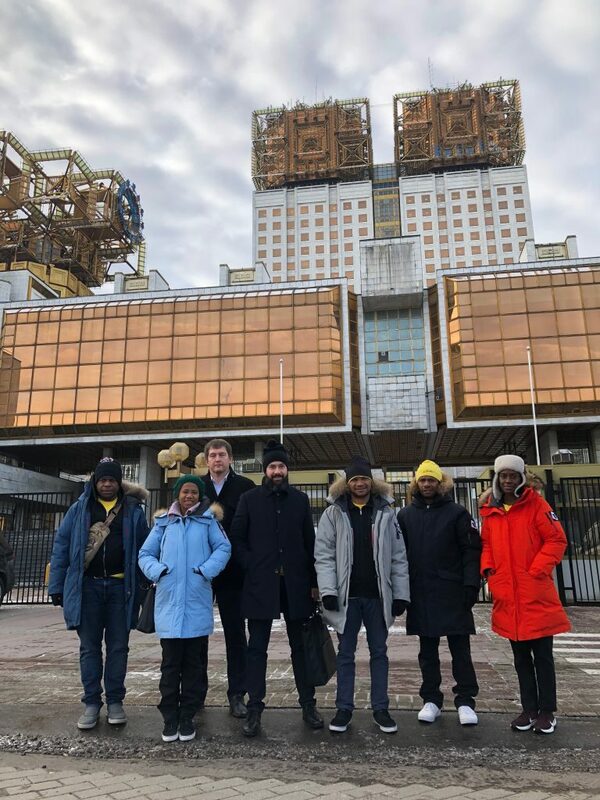 We are quite certain that this visit, albeit the very first one in modern Russian history, will be followed by many others! 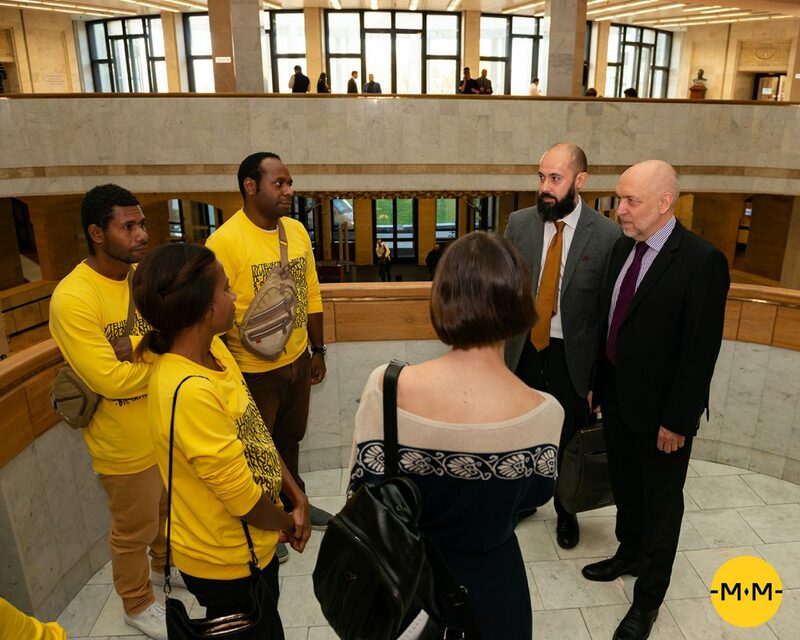 It has already left its mark in history and its importance is still further underscored by the fact that it took place in the lead-up to the APEC summit, to be held in Port Moresby, the capital of Papua New Guinea, on 8-18 November 2018. 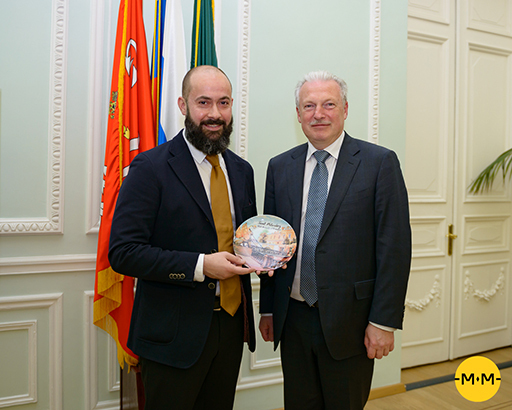 The summit will unite leaders of 21 nations and the Miklouho-Maclay Foundation, an accredited member of the official Russian delegation, is planning organise a host of cultural events aimed at maintaining business and scientific relations that will serve as a bridge between the two nations. 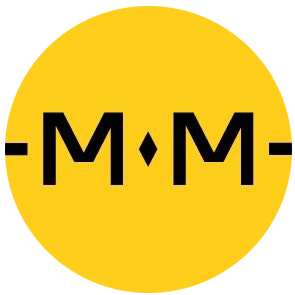 An exhibition Miklouho-Maclay. XXI century. 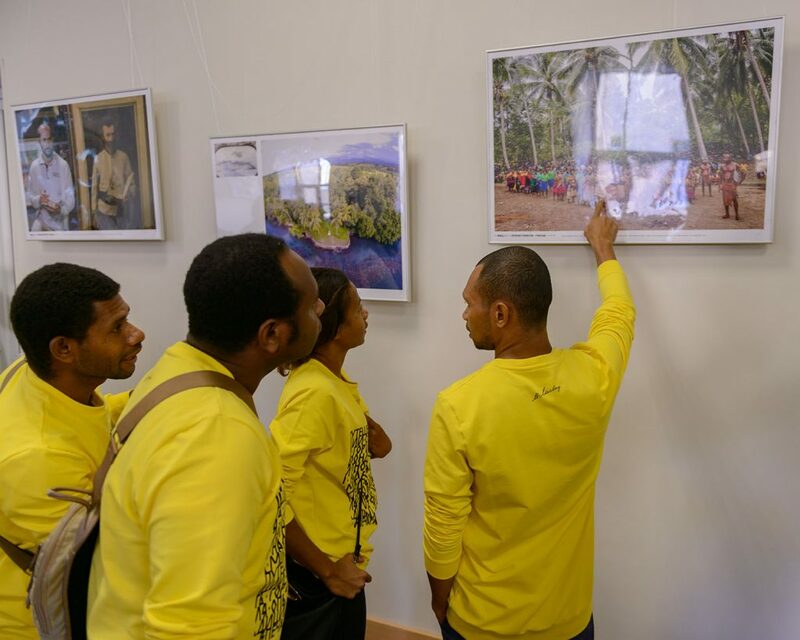 Revived History at the University in Port Moresby and APEC summit, featuring photographs and posters that illustrate XIX-c. life on the Rai Coast, based on the copies of drawing made by the great explorer and photographs taken during the 2017 expedition to the same location. 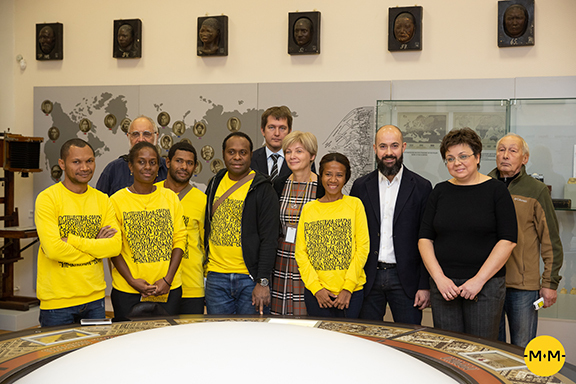 Presentation of a 6,5-minute documentary A Citizen of the World, for screening at universities. Presentation of a 36-minute documentary THE MOON MAN, directed by Miklouho-Maclay Junior, for screening on television. 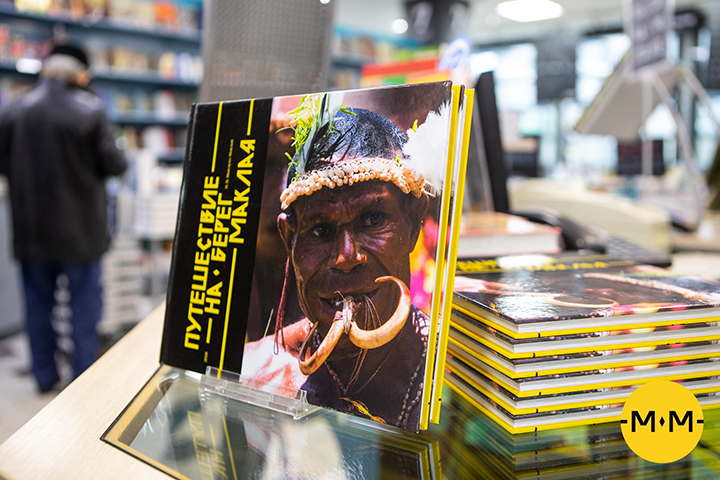 The business programme will feature the signing of memoranda between: the Russian National Library and the Papua New Guinea National Library and Archive, with the participation of the Miklouho-Maclay Foundation. 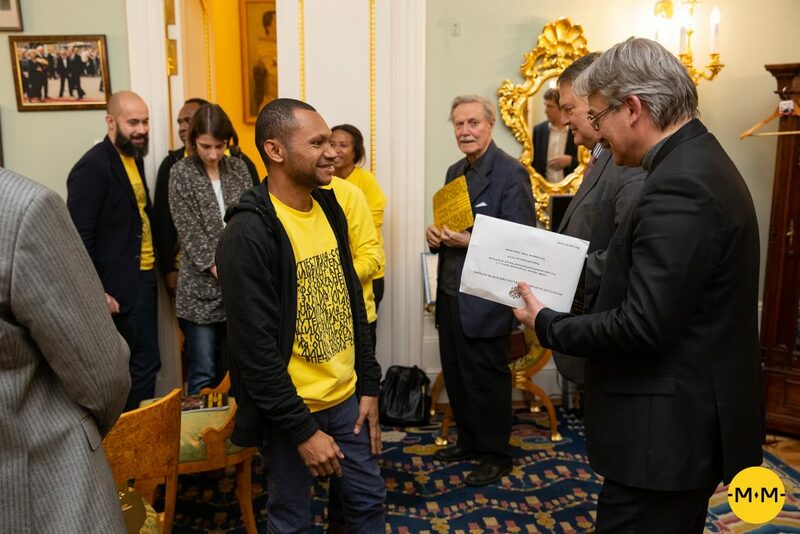 Memorandum of Cooperation between the Madang University and the Miklouho-Maclay Foundation. 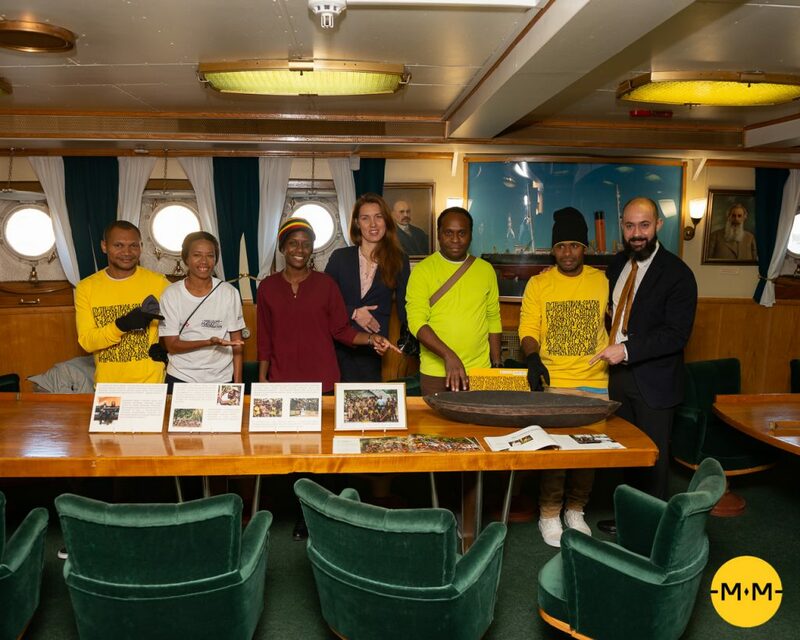 Memorandum of Cooperation and Assistance for expeditions to the Maclay Coast (Rai Coast), north-eastern part of New Guinea, Madang region, organised by the Foundation. 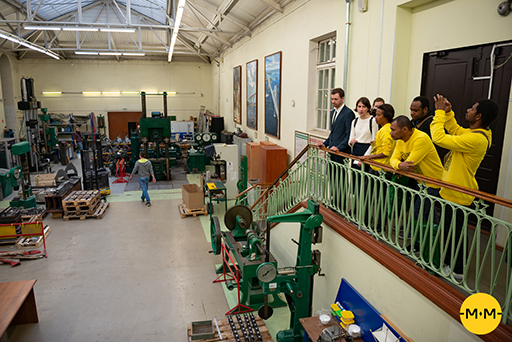 We would like to express our gratitude to all partners and friends of the Foundation, as well as organisations and private persons for their invaluable assistance in bringing this large-scale ambition historical project to fruition.